View of enrollment trends "misleading"
the PDF file. This is a 22.0 Mbyte high-resolution file with color photos. 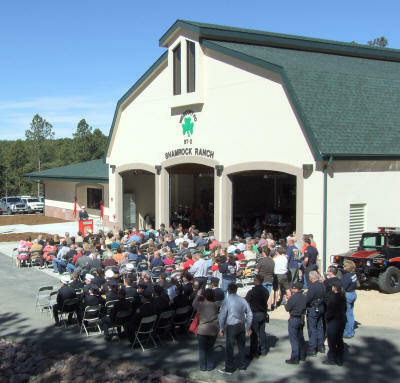 Below: On March 24, the Donald Wescott Fire Protection District dedicated its new Shamrock Ranch Station 2 to the memory of late Chief Jeff Edwards, who spearheaded the station’s design and construction contract. Memorial plaques dedicated to "Chief Ed" will be displayed inside the new firehouse and on an entrance pedestal. This $2 million firehouse, with a contemporary barn design to match its rural setting, is built on a five-acre lot at Highway 83 and Stagecoach Road that was donated by David and Mary Wismer, owners of the Shamrock Ranch. The ceremony included a parade up the new massively reinforced driveway, with bagpipes, by the Wescott staff, and presentations to the Edwards family, to the Wismers, to Kevin McCullough of firehouse contractor Colarelli Construction, to physician advisor Dr. Dave Ross, and to AMR operations manager Ted Sayer. Also there were champagne bottle christenings of the new AMR 582 ambulance and a new smaller-scale rural area pumper for use in the adjacent wooded areas with narrow driveways, a presentation of the official station key to the Wescott board and staff by McCullough (whose grandfather owned Shamrock Ranch before the Wismers), speeches by district board President Scott Campbell, Chief Vinnie Burns and senior shift commanders, and a ribbon-cutting by Chief Edwards’ widow, Debbie. Below: On Mar. 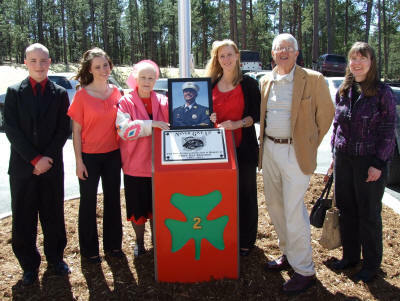 24, the Donald Wescott Fire Protection District dedicated its new Shamrock Ranch Station 2 to the memory of its late Chief Jeff Edwards to honor his leadership in getting the new firehouse designed, approved, and constructed as he fought terminal pancreatic cancer. The memorial at the front entrance honors Chief Edwards’ motto "Never Give Up." The monument was formally unveiled by Chief Edwards’ family during the dedication ceremony (from the left): son Brian, daughter Amber, mother Carol, wife Debbie, father Gerry, stepmother Terry Anderson. Click here for additional fire district coverage. Despite a concerted effort to strip nitrogen removal from regulations that would force extremely costly treatment methods on wastewater treatment facilities across the state, the Colorado Water Quality Control Commission voted on March 14 to include nitrogen in the new wastewater standards. Regulations 31 and 85 represent the first time all facilities will be required to remove phosphorus and nitrogen from their effluent—the treated water released back into streams. The regulations impose numeric restrictions on those two nutrients. The verdict followed two and a half days of testimony by 48 stakeholders that included the state’s Water Quality Control Division (WQCD, which set the new numeric standards); the EPA (which was requesting new standards); the Colorado Nutrient Coalition, representing 67 treatment facilities against the nitrogen standards; and mountain, Western Slope, and Front Range treatment facilities that detailed the effects the regulations would have on them. The commission then deliberated for four hours before making its decision. The WQCD argued that the regulations are necessary to clean state waters to standards that would "satisfy" the EPA. Public utility managers had no argument with phosphorus removal, but they argued that comparable levels of nitrogen removal would be nearly six times more costly to remove than phosphorus and that the science did not support removing both. Instead, they believed that phosphorus-only removal would be more likely to help take care of the problems caused by algae in state waters. In addition, public utilities lawyers, engineers, and scientific and statistical expert consultants argued that there is no state money available for what would be considered an unfunded state mandate, meaning the costs of treatment would be passed on to customers. Cost estimates to comply with this first round of capital improvements start at $2.4 billion. One victory for the wastewater utilities is that, for the next 10 years, the nitrogen limits in treated effluent will not be as strict as originally proposed. Instead of having to treat to a level of 10 milligrams per liter (or 10 parts per million), the limit is 15 mg/l. That change was made in Regulation 85, which affects the state’s largest 44 facilities. But, again, this change only lasts 10 years; after that, the numbers in Regulation 31 take effect. Regulation 31 sets more stringent total phosphorus and total nitrogen "interim values," starting in 2022. But the victory for the wastewater utilities here is that these numbers will be site-specific instead of a one-size-fits-all standard. Each treatment facility will have to prove it is doing no significant harm to waterways when it requests site-specific standards. This will require constant monitoring of the waters upstream and downstream of the facility. If a facility can demonstrate the waterway is equally healthy in both locations, then it can ask the WQCD to allow it to continue to treat wastewater with no additional plant modifications. This could prevent a facility from having to make a costly investment in new equipment. Regulation 85 still mandates the installation of new nutrient removal technology over the next 10 years for the 44 facilities. Original cost estimates to comply with this regulation ranged between $2.4 billion and $25 billion; in 10 years, the numbers could be vastly different. The equipment that can clean to those 2022 numeric interim values "hasn’t been invented yet, unless you count reverse osmosis, which is extremely expensive," says Mike Wicklund, Monument Sanitation District manager. The state is hoping that by making the regulation effective 10 years from now, less costly technology will become available to address nutrients. Newly built facilities will not enjoy the 10-year delay in Regulation 85 and will be required to immediately comply with Regulation 31’s 2022 numbers. The Tri-Lakes Wastewater Treatment Facility, which Wicklund’s district owns along with Palmer Lake Sanitation District and Woodmoor Water and Sanitation District, is one of the 44 treatment facilities—out of 319 total in the state—affected by Regulation 85. Each of these 44 facilities can treat more than 2 million gallons per day. Together, they produce 75 percent of the treated effluent released into Colorado’s waters. The smaller facilities will have to begin meeting the Regulation 31 standards in 2022. They include the Upper Monument Creek Regional Wastewater Treatment Facility, which is owned by Donala Water and Sanitation District, the Triview and Forest Lakes Metropolitan Districts, and the Academy Water and Sanitation District, which has a small lagoon system wastewater treatment facility. Academy, which is already facing decisions about how its lagoons will meet previously approved ammonia standards, will have to determine how to pay for phosphorus and nitrogen treatment. Wicklund said a "watershed monitoring group," composed of facilities throughout the Fountain Creek watershed, has been formed by the Pikes Peak Area Council of Governments. This group is developing plans for regularly monitoring state waters in the watershed. That will involve sampling along Monument Creek, Fountain Creek, and their tributaries, from Palmer Lake all the way to the confluence with the Arkansas River in Pueblo. "We’ll know about the algae on the rocks in those streams, and how much phosphorus and nitrogen is in that water," Wicklund said. "Then, when our permit is up, we will be able to develop cost-effective discharge permit limits based on studies of the watershed and ask for site-specific limits for each individual treatment facility." For now, Wicklund’s predicted $100-a-month increase in wastewater rates is not imminent. However, the unknown (and equally dreaded) Regulation 85 cost increases for all the wastewater districts in the Tri-Lakes area will still loom when the next round of five-year permits are issued. Monument’s facility will be able to handle the Regulation 85 nitrogen standard of 15 parts per million, but not the upcoming Regulation 31 interim limit of 0.6 mg/l. Upper Monument may be able to meet the Regulation 85 nitrogen limit, but Academy’s lagoons will never be able to meet them. All three facilities will need upgrades for total phosphorus removal. Furthermore, future costs for monitoring water quality in Monument Creek may bring about a "modest increase in user fees for all the affected districts throughout the Fountain Creek watershed," said Wicklund. Their preference to encourage cleanup of nutrients biologically, not chemically. The goal is for all treatment facilities to eventually have enhanced BNR (biological nutrient removal) plants on site and no longer use chemicals to treat nitrogen. The need to keep nitrogen part of the cleanup package, despite the much higher cost, instead of first trying to clean up only phosphorus to see if that would solve the problems. They considered dropping the nitrogen limit but decided that if nitrogen limits were not part of the regulations, then treatment facilities would not consider it in their future building or upgrade plans. The need to demonstrate "progress" toward nutrient cleanup "encouraged" by the EPA during testimony. The need to be sensitive to the heavy burden of the cost of treatment, which would be borne by ratepayers, to be "fair and equitable," and to be able to convincingly demonstrate "harm" to the waters before asking the ratepayers for more money. The idea of "pollution trading," which has been done in other industries and involves cleaner, larger facilities removing more nutrients than required and trading credits for this additional removal with smaller facilities that cannot afford an upgrade to meet new nutrient standards. These trades would ensure more overall nutrient removals to better meet the goals in Regulation 31. The need to match the pace of the treatment standards with the technology available to accomplish it, giving the technology time to "catch up." The commission’s hope is that by the time new standards kick in, the technology will exist to treat to those levels; currently it does not. Not part of the equation was Gov. John Hickenlooper’s Executive Order 5, which prohibits unfunded state mandates that have no basis in federal law. On the Friday prior to the hearings, the governor’s office had sent letters to the commission and the EPA explaining that the nutrient regulations were the first test of this executive order and that the governor’s office was still reviewing the implications. The letter said the hearings should maintain their focus on the proposed regulations and not the executive order. On May 14, the Water Quality Control Commission will be presented with the final draft of the two regulations and their supporting statements, showing all the changes adopted at the March hearings. These documents will likely be approved. The EPA will announce in July whether or not it concurs; if and when that happens, the regulations will go into effect. Then, as treatment facilities’ permits come up for renewal, the new numbers will become the facilities’ new nutrient requirements, and they will be given a certain time period to comply. New facilities will be built or current ones upgraded to help them meet the numeric standards. Also, state legislators have gotten involved. Rep. Marsha Looper (R) and Sen. Keith King (R) have cosponsored House Bill 12-1161, which would have the joint Interim Water Review Committee hold a public hearing on the proposed nutrient standards. This committee would forward a recommendation to the state Legislature to vote on the Water Quality Control Commission’s March decision. As of this writing, according to Jim Kendrick of Monument Sanitation District and the Colorado Nutrient Coalition, who has been meeting with the bill’s sponsors, the House bill has been approved by the House Agriculture, Livestock, and Natural Resources Committee and the House Appropriations Committee. Approval by the Senate Agriculture, Natural Resources, and Energy Committee is the next step. From there, the bill would go to the House and Senate for separate floor votes. If approved by both, the bill would then be forwarded to Hickenlooper, who would determine whether his executive order applies. If it does, then the state must find funding to pay for facilities’ upgrades. If it does not apply, then residents of the state will have to foot the bill. Click here for additional coverage of water and sanitation districts. On March 15, the Lewis-Palmer School District Board of Education unanimously approved a charge of 50 cents per ride for bus transportation beginning in the 2012-13 school year. A multiple child discount so that no family would be required to pay more than $500 per school year. Additional attempts to make payment easier for families. The district would request a $25 deposit by July 1 for those wishing to use the service. This would allow for any necessary adjustments in routes. If the deposit causes hardship, parents will be urged to sign up anyway. Parents may pay $150 in advance for an entire year of service. Any remaining balance at the end of the school year remains in the account until the family leaves the district or the student graduates. The first swipe card will be provided to the student free of charge, paid for by a grant received by the district. There will be a $5 replacement fee for the first lost card and $10 for each additional card. Students will have a swipe card regardless of whether they choose to ride the bus. It has not yet been determined whether the card will remain with the student all day (perhaps combined with the card used to purchase lunch) or will remain on the bus. Parents can add credit to the card via the district’s website. They will be notified if the balance falls below $5. Wangeman also pointed out that those students who are entitled to free or reduced price lunches will not be charged for transportation. Their cards will look like everyone else’s, but the Transportation Department will make note of their status. Special needs students whose individual education plan requires bus transportation will also be exempt. Bus drivers will not be involved in enforcing payment of the fee. If students come to a stop without a card, the driver will take them to school and make a note of their names. At the end of the day, parents will be called to pick up those students. The card can only be used for trips to and from home and school, not between schools. Board Vice President Mark Pfoff said that he never thought that he would support the fee, but has concluded that the choice is between a bus fee and eliminating teaching positions. State cuts in funding of schools are forcing the district to make this decision. The district is providing a service in exchange for the fee and parents have the choice of whether or not to participate. Board Treasurer Gail Wilson said that she, too, hesitated to support the measure in the context of a free education for all. However, she said that the district needed to consider what is best for the student. Use of bus fees, proposing a mill levy override, and using reserves are three options the board can use to restore positions and services that have been cut over the past few years. Having heard school improvement plans in District Accountability Advisory meetings, Wilson is concerned about the impact of lack of intervention and enrichment services in our schools at all levels. In addition, the number of special education students and those on free/reduced lunch is growing. She promised to help educate the public about the consequences of past and future cuts in the event a mill levy override is proposed. Board member John Mann said that the problems of the school district affect the entire community, and he is concerned that relatively few are being asked to pay the fee. He said that the growth in class sizes and utility costs make action necessary. Board President Dr. Jeff Ferguson said that excellence in education must be the driving force behind any board action. He acknowledged possible hardship in paying the fee, but said that this is one of few options available. It was stressed that any change in the fee must come before the board for a vote. Director of Assessment, Gifted Education and Technology Lori Benton reported that the proposed homeschool academy is designed to support and enrich learning among homeschooled students. Art, music, and physical education will be offered. Benton presented an estimate of the cost of beginning the project, to include the hiring of a lead teacher, preparation of the building, and operating costs. She said that 18 students have enrolled. The next step is to hire a lead teacher and hold an open house in May to encourage additional enrollment. The revenue per student is equivalent to that for a half-day kindergarten student. Wilson said that she was encouraged by the community’s interest, and Ferguson said that creating such an academy is an appropriate thing for the district to do. Wangeman increased the projected revenues in the budget by $306,490 for the school year 2012-13. Contributing to this increase are savings in utilities, success of the food service department, increased tuition due to increased enrollment, and other factors. Wangeman said that $720,000 remains in the fund collected by the county from developers, based on the number of residences constructed. The purpose of the fund is to purchase land on which to build schools. Because the district does not require further land for schools at this time, it is entitled to withdraw from the account and apply the funds to capital maintenance and improvement in the district. The board had originally intended to withdraw the funds over three years. The first withdrawal was made last year. Wilson said that the district should withdraw the entire amount to expedite improvements in intervention and enrichment for students who are falling behind. She said that if students are weak going into high school, it will adversely affect their post-secondary education. Mann questioned the use of $350,000 for a one-time fix, whereas a mill levy override (MLO) would provide funding for the longer term. The board passed a resolution to withdraw $350,000 from the cash in lieu of land fund. Superintendent John Borman said that per pupil funding is now $6,142, $5 more than anticipated. He stressed, however, that the state no longer funds growth within a district, so if the student population grows, the price per pupil in the state declines. One concern for school funding is the possibility that the homestead exemption for senior citizens’ property taxes may be reinstated. This exemption is not based on need, but on age and length of residency. If restored, the exemption would remove $800,000 per year from the state budget. The district has set aside $200,000 for unexpected fluctuations in enrollment. The February update from the governor anticipates that the cut in per pupil funding next year may be $52 rather than the estimated $110. Borman said that he anticipates cutting spending by $1.35 million for next year. Borman projected a growth of 110 to 115 students in next year’s enrollment. He estimated a need of 7.2 new teachers, primarily at the elementary level. The district gained 129 students during this year’s open enrollment period, compared to 39 last year. This was attributed to the district’s communication campaign. To be conservative, next year’s budget will be based on an increase of 60 students. Borman said that he has spoken with principals of all schools. He said that the class of 2011 benefited from the MLO passed in 2001. Present class sizes are a major concern, and students needing extra help and support are often not receiving it. Before the beginning of major cuts a few years ago, each location had reading and math interventionists, a librarian, and a full-time counselor. This is no longer the case. Borman said the district should address grades k-3 first to reduce class sizes. Middle school classes are also large and all interventionists are gone. Schools also had instructional coaches to aid in teacher development. Other funding for teacher development has also been eliminated. Wilson commented that if D-38 wants to be a world class district, it needs to replace the interventionists at all levels. Board Secretary Robb Pike said that an MLO would slow the decline of the district, but the state will continue to cut funding in the future. He said that the district is holding the line but needs to determine what is involved in running an MLO campaign. He suggested getting a community group to gauge community sentiment on the subject and the likelihood of success. He also suggested paying down some of the district’s debt to free up funds. The board passed a resolution designating March to be National Volunteer Month and expressed its gratitude for the contributions of all of its volunteers. Director of Personnel and Student Services Bob Foster reported that the district’s policy on suspension and expulsion had recently been reviewed. The policy requires very few expulsions, although state statute requires them under some circumstances. The district now has a deferred expulsion program in which students receive counseling and have to agree to undergo corrective measures before rejoining the student body. Borman said that each case is considered individually and that he and Foster meet with each student. The board recognized winners of the recent district chess tournament and heard a presentation of the Preamble of the Constitution by a fourth-grade class from Kilmer Elementary School. Boy Scout Troop 6, attending the meeting as a requirement for the Community Merit Badge, led the pledge of allegiance before the meeting. 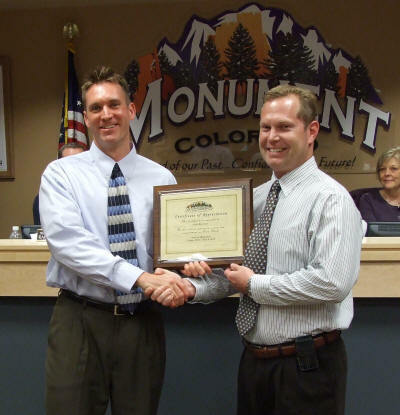 George Douthit, vocal music teacher from Lewis-Palmer High School, was recognized for winning the Educator of the Year Award from the Colorado Springs Choral Society. Douthit was nominated for the honor by former Superintendent Ted Bauman, who introduced him. 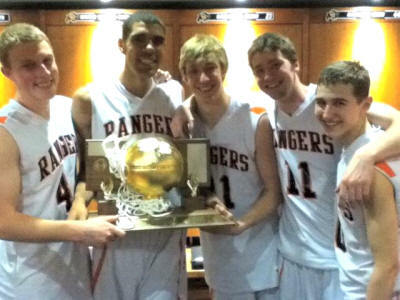 The state champion Lewis-Palmer High School Rangers basketball team was celebrated for its recent success in the 4A division. Superintendent Borman, a former coach, said a few words about the achievements of each team member. The board approved a list of routine items such as minutes and agendas of previous meetings, appointments and resignations, lists of support and substitute staff, and contracts. The Board of Education of the Lewis-Palmer School District meets at 6 p.m. on the third Thursday of each month in the district’s learning center, 146 Jefferson St., Monument. The next meeting will be held on April 19. Below (L to R): Seniors Scott Hawkins, Josh Scott, Ethan Riker, Tim Helwege, and Ethan Hollenbach celebrate LPHS state championship in the 4A division. Photo provided by David Hollenbach. Below: On Mar. 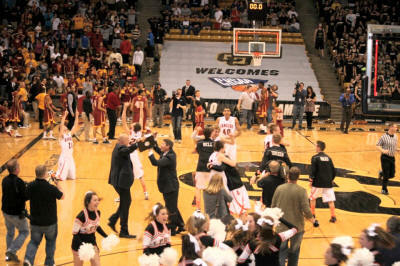 10 in Boulder, jubilation moments after LPHS defeated Sierra 44-43 to win the Colorado 4A Boys championship basketball division title. Photo by Dana Hollenbach. Committee member Karen Shuman suggested at the March 14 meeting that the District Accountability Advisory Committee (DAAC) allow Building Accountability Committees (BACs) to be informed of all budget cuts in the district over the past few years. DAAC Chair Steve Braun said that he would supply this information over the next few weeks. Shuman commented that consistency in messaging is important. She attended some of the meetings about transportation fees and was surprised at how little people know about the extent of budget cuts over the last four years. Little information was provided during BAC meetings. She recommended that representatives from DAAC make use of Fusion sites and school websites to provide necessary information to parents. Committee member Georgina Gittins, a member of the transportation fee task force and parent from Bear Creek, suggested posting the information on bulletin boards in the schools. Board liaison Gail Wilson said that a number of initiatives are under discussion in the state Legislature. House Bill 101 and Senate Bill 191 involve methods of evaluating teacher performance on the basis of student achievement. There is a discussion to modify the terms of the Public Employee Retirement Association retirement system structure, which costs more each year. There is concern that the senior homestead tax exemption may be reinstated, costing the state much revenue. The board would encourage the Committee for Political Achievement to contact both local candidates for the state House regarding this subject. HB 1238 proposes that those students not reading at grade level by third grade shall be retained. Wilson said that Gov. John Hickenlooper will hold a series of panels on legislative matters. Those in El Paso County will be held on April 10 and May 13, and all citizens are invited to apply to appear. Lewis-Palmer Elementary School Principal Lois Skaggs reported on her school’s improvement plan. The school’s academic achievement exceeds requirements in all 20 targets for academic performance. Growth requirements in reading, math, and writing were met. The school’s goal for math proficiency is 90 percent. Writing proficiency for English Language Learners (ELL), students needing to catch up, and those on free/reduced-cost lunch, meet state requirements. The school’s action plan is to identify struggling students as early as first grade and use Mountain Math as a supplement. Parents will be provided with tools and games to use at home. Math nights will be held for students and parents. Bear Creek Elementary Principal Peggy Parsley presented her school’s plan. The school’s overall academic achievement rating shows it meets all targets in reading and math. Bear Creek is a Title 1 targeted assistance school, allowing it to receive some assistance in reading intervention. Reading is a focus at the school because the population of English Language Learners is growing. There is a growth gap in math due to lack of consistent language and too little time per day spent on the subject. Wilson commented that as federal and state budgets continue to be cut, the district is on the verge of losing Title 1 funding. Lewis-Palmer High School (LPHS) Principal Sandi Brandl said that the school’s academic achievement exceeds requirements in all categories, scoring in the 90th percentile. The school also exceeds requirements in workforce and post-secondary categories. The school meets academic growth requirements and is approaching requirements in growth gaps. The ELLs do not meet requirements in writing. Principal Caryn Collette explained the improvement plan for Lewis-Palmer Middle School. The school meets all requirements for growth and growth gaps and exceeds requirements for overall academic achievement, earning it the status of a John Irwin School of Excellence in the 2010-11 school year. Special education students did not meet the adequate yearly progress in math and reading. Causes of the shortfall include loss of reading and math intervention and the growing size of case loads for special education teachers. A literacy committee was formed to assist writing across the curriculum last year. It taught students to pre-write, edit, and do final drafts of papers. This year the school is working on reading across the curriculum and coming up with strategies to embed it in lesson plans. Committee for Political Achievement Chair Cori Tanner reported that DAAC is collaborating with the Drug Enforcement Administration (DEA) to inform the public about the Healthy and Drug-Free Colorado ballot measure. The measure proposes to legalize marijuana in Colorado, with a legal age of 18. This issue is separate from the legalization of marijuana for medical use. It would still be illegal to possess or be under the influence of marijuana on school property. Tanner said that an informational meeting on the issue would be held the following week at LPHS. The District Accountability Advisory Committee meets at 7 p.m. on the second Tuesday of each month. Locations vary. The next meeting will be held on April 10 in the district’s Learning Center, 146 Jefferson St., Monument. Bobbie Weber and Jody Minarik, coordinators of District 38’s transition program, Discover, offered a presentation on their program at the March 14 meeting of the Special Education Advisory Council. The transition program serves district students ages 18 to 21, with an active individual education plan (IEP). The program is housed in part of the Grace Best building near the district administration building. Participants in the program receive training in life skills that could lead to eventual independent living. They may participate in the program until the end of the semester in which their 21st birthday falls. Some students take the Accuplacer test and qualify to attend community college to learn career-related skills such as welding, culinary arts, auto mechanics, and bookkeeping through the Area Vocational Program at Pikes Peak Community College. Transportation to the campus is provided and some of the students receive an associate degree as a result of their studies. College instructors remain in close touch with transition staff to monitor student progress. Students participating in the vocational program develop such skills as self-advocacy and the ability to ask for what they need to complete a task. Colleges do not refer to IEPs or other high school documents in assessing a student’s capabilities. Transition staff members meet with students as they leave the high school environment and ask them about their goals. They then determine a plan to meet the goals over the time allotted. For those students who are unable to live independently at the end of the program, the Colorado State Resource Board may provide day services. Another local resource is Bright Future, an adult daycare facility. Students who have met high school graduation requirements participate in the traditional graduation ceremony, but do not receive a diploma until they reach their goals or reach the age of 21. Director for Exceptional Student Services Mary Anne Fleury reported that she had recently attended a meeting of the state Special Education Reinvented task force. The group said that a great deal of money has been spent on special education over the past decades with little result. The group plans to apply to the federal Office of Special Education Programs for a waiver for the state of Colorado, which it says would allow it to spend federal resources in the most effective way. One of the group’s proposals is to create individual growth plans for all students, not just those in the special education program. In this way, every student would work toward individual goals and the social stigma of an individual education plan (IEP) would be eliminated. The group also discussed changing teacher certification requirements so that new teachers will receive more in-depth training in working with students with special needs. Fleury said teachers are needed who will do whatever is necessary to allow all students to reach their individual potential. One current handicap is the inability to get general education teachers released from their daily responsibilities to attend special education training. The Special Education Advisory Council meets at 6:30 p.m. on the second Wednesday of each month in the district’s Learning Center, 146 Jefferson St., Monument. The subject of next month’s meeting is smooth transition for students moving from elementary to middle school and middle to high school in the district. During the March 21 board meeting, Fire Marshal Margo Humes and Chief Vinny Burns explained the Donald Wescott Fire Protection District staff’s views on how fire safety is enhanced by automatic sprinkler systems. Humes reported that about one-fourth of the businesses in the district have been inspected. She has been appointed by the International Association of Arson Investigators as the district leader for nine counties in this region. Humes showed a video of the infamous Warrick, R.I., Station night club fire that killed over 100 people in 2003. She also showed a comparison test video of an identical space being ignited by the same pyrotechnics on stage being knocked down in less than a minute by an automatic sprinkler system. Temperatures never exceeded 120 degrees and oxygen levels and heat flux remained survivable. She said sprinkler systems provide life safety, particularly for houses with an eight-minute response time. Sprinkler systems do not necessarily put out all of a fire. About 95 percent of the fatalities in a home fire are children, and automatic sprinkler systems have prevented deaths when they have functioned properly. There has never been a recorded loss of life in a structure protected by a properly maintained automatic sprinkler system. No one has ever drowned from an activated sprinkler. Water damage caused by sprinklers is less than the fire damage. Sometimes sprinklers put out a fire while no one is home. Sprinklers do not stop structure fires started by wildland fires. Nothing else works as well as sprinklers for containing or putting out a house fire. Every sprinkler head does not spray at once in modern sprinkler systems, although they are shown doing that on some TV shows and in movies. Only the sprinkler heads affected by heat operate. Most fires extinguished by sprinklers have been put out by five or fewer heads. The relative affordability of a sprinkler system in a new 6,000-square-foot or larger home in a wooded area is far less of an issue than the cost of it for a 2,000-square-foot home. There can be problems with leaks and anti-freeze in sprinkler systems in homes that lose heat or other utilities. The initial cost and ensuring competent installation of a well-designed system in what are typically custom houses can be a problem. Burns then discussed a Board of County Commissioners hearing to be held on March 27 regarding the county’s endorsement of the 2003 International Fire Code provisions requiring automatic sprinkler systems. The Housing and Building Association (HBA) and the Pikes Peak Regional Building Department are opposing any code requirement for residential sprinkler systems. A compromise position on requiring sprinkler systems for new homes larger than 6,000 square feet was proposed and adopted by the Wescott board. Burns noted that for a house that size in an area with no hydrants, it is impossible to establish and maintain a water flow of at least 250 gallons per minute long enough to control a fire. The main issue now for the Wescott board is whether to allow a certificate of occupancy for a new district home that passes the weaker county fire code but not the Wescott fire code. Board President Scott Campbell endorsed the Wescott firefighters’ position that the 6,000-square-foot minimum is necessary for resident and firefighter safety. New lightweight construction materials, such as I-beam floor trusses, collapse more quickly and burn hotter due to the chemicals used in manufacturing than solid wood joists that used to be standard construction materials. Other lightweight and synthetic building materials and newer foam mattresses also burn hotter and more quickly. Other board members discussed the pragmatic reality that if Regional Building issues a certificate of occupancy, homeowners will move in. There was a lengthy discussion of the technical details of overlapping codes of different levels and types of local governments. There was consensus that every stakeholder group is "lawyering up" with regard to future liability when there is an inevitable future fatality in a structure that does not have an automatic sprinkler system due to a local government exemption for the basic International Fire Code sprinkler requirement. Regional fire districts have adopted different versions of the International Fire Code (2006 or 2009) and the new international code version will call for sprinkler systems in every building in the near future. At a minimum, the various North Group fire districts will be looking at buying more and larger tender trucks, 1,500 gallons or larger, to carry water to outlying rural fires now that there is no sprinkler system mandate for any homes in outlying areas with no locally available water supply. This presents a dilemma for the Wescott board, because Wescott’s staff has deployed the district’s only water tanker vehicle out of state when it deploys firefighters during wildfire season, the time when the risk of a large house fire in a wooded area spreading to other adjacent homes is the worst. Wescott has numerous pumpers, including a brand new smaller pumper for structure fires in wooded areas, as well as brush trucks that also are used in wildfire deployments. As noted above, these trucks do not carry enough water to sustain an adequate flow without tender replenishment. Note: The Board of County Commissioners approved the resolution for an elimination of all automatic sprinkler system requirements, which was requested by the HBA and Regional Building on March 27. Falcon Fire Protection District Chief Trent Harwig spoke in opposition to a total exemption. See agenda item 12 at http://bcc2.elpasoco.com/bocc/agendas/2012AgendaResults/12-03-27.pdf for details. Total expenses for February were $135,254. About 15 percent of the budget, $294,466, has been spent in the first two months. The final payment to Colarelli Construction for Station 2 will be about $53,000. There is about $35,000 of non-construction contract work remaining to be completed which will be paid from the station’s contingency fund. Final budget numbers for 2011 should be available at the April board meeting. The amount of unspent 2011 revenue rolled over to the 2012 budget will be about $142,000. Assistant Chief Scott Ridings reported 145 calls in February compared to 116 calls in February 2011. It is projected that once the new Station 2 is fully operational, 80 percent of calls will have a response time of four to six minutes and 90 percent will have a response time of six to eight minutes. This is a big improvement for a service area the size of Wescott’s. Ridings reminded the board that AMR ambulance response times to calls at Fort Carson will still skew average times for all Wescott calls, because those response times are a minimum of 20 minutes. Three Wescott personnel will be assigned to the pumper at Station 2, and two personnel plus an AMR medic will be assigned to Station 1 on Gleneagle Drive, with two on the ambulance and one as driver of the ladder truck. Tri-Lakes ambulance personnel will no longer be assigned to Station 1. Director Harland Baker asked Ridings to provide a performance report using the new software for the past eight quarters to better show how the district’s capital investments in apparatus and the new station will improve response times. Ridings said he would prepare this report for the board. The meeting adjourned at 8:55 p.m. The next meeting will be held at 7 p.m. on April 25 at Station 1, 15415 Gleneagle Drive. Information: 488-8680. Jim Kendrick can be reached at jimkendick@ocn.me. At the March 28 meeting of the Tri-Lakes Monument Fire Protection District, Board President Charlie Pocock said a mill levy increase might be necessary as the district faces further budget restrictions. He noted that stringency was required in the upcoming budgeting process. Pocock said discussion of a levy increase of about 1.5 mills would be warranted if costs cannot be covered by property tax revenues even with further tightening of expenditures. He added that the upcoming Supreme Court decision regarding the Patient Protection and Affordable Care Act might affect the district’s costs and the need for a mill levy increase. Pocock said that cancellation of the sprinkler requirement for residential living by the El Paso County Commissioners means that discussion and interest in the residential sprinkler code issue will continue. While some fire agencies felt that this was an improper move by the commissioners, Fire Chief Robert Denboske said the only way to move forward was to continue discussion and investigation into the experiences and standards in other parts of the country. He indicated that the Tri-Lakes Monument Fire Protection District stood ready to enter into negotiations and investigative discussions on the subject. Treasurer John Hildebrandt said the district had received $89,033, or 3 percent of the annual budgeted property tax revenue through February. Specific ownership taxes received were $46,159, or 18.5 percent, with the budgeted revenue $249,360 down $24,766 from 2011 ($274,126). For the first time in several months, ambulance revenues were slightly below budget at $89,840, or 16.33 percent. Hildebrandt said administrative expenses were up because of payment on liability insurance and maintenance contracts. Salary costs were slightly higher because of three paydays in January. Electricity costs for Station 1 and gas for Stations 1 and 2 were also running high. Overall expenses through February made up 18.58 percent of the annual budget, or 2.25 percent over budget, which was down from 3.1 percent over budget in January. Denboske advised the board of the revisions to the district’s uniform code, which include guidelines on proper uniform appearance, restrictions on jewelry and extra clothing while on duty, and changes in the uniform benefit. The full changes in the uniform manual are available at the district administrative offices at 166 Second St. in Monument. Pocock advised the board members that at the April meeting a district audit presentation will be heard. Real estate executive Rick Cheever asked that he be considered for appointment to an upcoming vacancy. The board advised him that he would be considered provided that he files the appropriate paperwork. The meeting was closed for an executive session to determine board positions relative to matters that may be subject to negotiations, developing strategy for negotiations, and instructing negotiators. The next meeting will be held at 6:30 p.m. on Wednesday, April 25, in the Administration Center at 166 Second St. in Monument. For further information regarding this meeting, contact Jennifer Martin at 719-484-0911. At the March Woodmoor Water and Sanitation District (WWSD) board meeting, concerned residents discussed the availability of service charge (ASC) imposed on residents owning vacant lots in Woodmoor. Historically the district has charged an annual ASC fee of $25. However, if residents own a vacant lot adjacent to their existing property and submit an administrative lot line vacation form to the district, the fees on that lot can be withheld until the property is sold. So, residents can choose not to pay the fee each year, but if the property is sold all outstanding annual fees are due to the district. The board unanimously approved retaining the ASC fee of $25 per year for contiguous lots. Director Jim Wyss was excused from the meeting. Woodmoor resident Maria Colosimo requested a reduction in the monthly Renewable Water Investment Fee (RWIF) for low-income residents. President Barrie Town said, "We cannot make an exception for one single resident, what is for one citizen is for all." The board considered all possible situations prior to finalizing its decision to impose the fee equally to all Woodmoor residents, he said. Assistant Manager Randy Gillette gave the operations report, saying the performance requirements for the pump and motor on well 12 have been reassessed. A smaller pump will be installed, based on the past history of the well. Gillette also stated that the district diverted 51 acre-feet of water from Monument Creek to Lake Woodmoor through the exchange process. Gillette stated the Kum-N-Go gas station on the southwest corner of Knollwood Drive and Highway 105 is moving forward. District Manager Jessie Shaffer stated the Special District Association (SDA) is interested in doing a two-part cover story about WWSD in April and May 2012. The SDA wants to highlight the district’s renewable water plan. The monthly articles will be available on the district website: www.woodmoorwater.com. The WWSD website has recently been updated with some significant changes, including picture galleries, conservation information, and planting tips. The next regular board meeting will be held at 1 p.m. April 12 at the Woodmoor Water and Sanitation District Office, 1845 Woodmoor Dr., Monument. For information: 488-2525 or www.woodmoorwater.com. What in your background would help you as a WWSD board member? The following are the answers we received from the candidates, printed with very little editing. The candidates are listed alphabetically by last name. I’m a 24-year resident of Woodmoor and a longtime community advocate and volunteer. My community service has included three years on the Woodmoor Improvement Association (WIA) Board, four years on the NEPCO Board—an advocacy group representing homeowners in northern El Paso County on issues involving land development and corresponding infrastructure needs. Through NEPCO, I have both provided and received community education on issues regarding zoning, water, roads, and other regional interests. I have served on District 38 Accountability, Tri-Lakes Cares, and numerous other boards. I have been a member of the Woodmoor Water and Sanitation Board for two years. I first became knowledgeable of the district’s long-range planning over 10 years ago (while serving as WIA president) when they purchased Lake Woodmoor as a strategic asset from a private entity. I have spent 30 years in the software industry, been a business owner, and have a BS in Organizational Leadership. I believe leadership goes beyond dealing with today’s pressing issues to thoughtfully planning for future generations. I believe continued long-term planning and addressing future gaps in supply versus demand are critical. Being able to supply a reliable future water source which is renewable, versus counting on the water that is being mined from the aquifers, is essential. We should also be encouraging conservation. Colorado water issues are complex, and I’m committed to protecting Woodmoor’s place at the table, as water continues to escalate as a significant statewide and regional economic challenge. With that said, pursuing partnerships along the way with other regional entities will help reduce our costs—such as what we do now with our regional waste treatment plant. Working with regional suppliers, while protecting the interests of our residents, is a delicate line every board member must understand. Readers can contact me at bethcourrau@comcast.net. We have a systematic disregard of elected individuals on what the purpose of their responsibilities is. I am running for one of the board positions to bring back what the purpose of an elected board is supposed to be. It was clear from the meetings I attended that the vast majority of the customers were not in favor of buying the ranch for the price paid, and no plan for delivery. It was irresponsible to move forward with buying the complete ranch. Issues such as math of current vs. build-out acre-feet was totally exaggerated, well pumping costs vs. pumping uphill for 30 or 40 miles, quality of the water, lack of inquiry with Colorado Springs Utilities as a partner in the Southern Delivery System, lack of cooperation with other nearby water districts, calling the increase a "fee" instead of what it is, a tax, etc. The board needs to be responsive to the customers, and proper decisions need to be made, not wishful bloated projects which burden the customers with excessive fees. Expanding on this point, we need a new board that will review what has been done and what direction we should take in the future. I believe we should mitigate what we can with the purchase already made, and decide what the next step is. And I do not believe in going further into debt by spending tens of millions more to bring the water up here. We already will pay $45 a month till most of us die. We do not need more "fees" which could easily exceed $100 a month on top of what we have now. I believe the operation of the water district is and has been handled very favorably since I have lived here. I do not, however, believe the current board represented us. I have lived in Woodmoor over 26 years with my wife, Mimi Schwab. I am a licensed Colorado dentist, and have practiced dentistry in Colorado for over 28 years. I received a doctorate in medical dentistry from the University of Pittsburgh, and a master’s in biology from Texas A&M University. My wife is a registered nurse who works with terminally ill patients at Pikes Peak Hospice. My science background makes me uniquely qualified to work with the water board, particularly with governmental regulations. The two most compelling issues facing our water board are: (1) ensuring a continuing supply of potable water; and (2) how to deal with intrusive governmental rules and regulations for our sanitation system and water district. If elected as a water board member, I will continue to look at any and all reasonable ways to augment our current water supply and plan for the future. As to the governmental regulations, I will assist the water board with my extensive science background and education to help find a balance between necessary regulation and oppressive regulation that merely increases the cost for our water usage, and work to find a balance between ensuring a continuing water supply for the future, maintaining costs, and complying with governmental regulations. I love living in Colorado and have thoroughly enjoyed our 26 years of living here in Woodmoor. I am committed to running the water board the same way that I ran my dental practice: providing the best service at the most efficient cost, while taking care of today’s problems, and planning and preparing for the future. I bring a great deal of energy, science background, and enthusiasm to this potential water board position. I have an engineering degree with experience in civil engineering working with community infrastructure, including water and wastewater delivery systems and treatment facilities. I served on the Board of Directors of the WWSD from 2000 to 2008, and as board president from 2006 to 2008. During this period, the district completed the purchase of Lake Woodmoor and installed the Monument Creek Exchange System. Both of these efforts have helped lower the demand for well water within the district. In 2010, I was appointed to the board to fill an unexpired portion of a director’s term. I have also been active in the community: four years on the Board of Directors of the Woodmoor Improvement Association, a life member of Kiwanis International, and a charter member of the Monument Hill Kiwanis Club. The two biggest issues facing the WWSD are: one, acquiring an adequate supply of renewable water to meet the demands of the district now and into the future; and two, delivering that water to the residents of the district at an affordable cost. The purchase of the JV Ranch property and its associated water rights has addressed the first issue. The second issue, delivery of the acquired water to the district at an affordable cost, is perhaps the district’s greatest challenge. However, WWSD is not alone in this arena. Monument, Palmer Lake, Triview Metro District, Donala Water District, and a host of other communities along the Front Range rely on the Denver Basin aquifers and all need a renewable supply of water. By thorough planning, partnering with these districts, and sharing the expenses of the infrastructure, the costs to the WWSD residents can and will be reduced. I have been on the water board for four years and the board president for the last two years. I have served on several boards over the years and involved myself in volunteer activities (mostly through Kiwanis). I am a retired Army colonel and have several years of international corporate experience. The biggest issue facing Woodmoor and all other communities up and down the Front Range is the availability of affordable water. We have made great strides toward ensuring that renewable water is available to Woodmoor for generations—now we have to limit the financial impact renewable water has on the families of our communities. I believe the best way to accomplish this is by maximizing the value of the resources we have just invested in. The second-largest issue facing WWSD is water treatment and the building of cost-effective, efficient, and secure delivery systems to our customers. Our community will grow, and we have to meet the demands of this growth with proper planning. Below: Barney Fix of Merrick & Co. presenting his company’s water system report to the Triview board. Photo by John Heiser. At the March 13 regular meeting of the Triview Metropolitan District Board of Directors, Barney Fix, vice president of Merrick & Co., presented his company’s report on its work with the district’s model of the water distribution system. Fix said they conducted 14 fire flow tests. By adjusting the friction factors and other parameters in the model, Fix said that, at most points in the system, they were able to match the real-world results within two pounds per square inch (psi). He noted a discrepancy of six psi remains between the model and the measured results for the 12-inch water main that runs along Baptist Road. He suggested there might be a problem with the pressure-reducing valves in that area. Fix noted that there are significant low-pressure issues in the northeast corner of the district. When the fire flow tests were conducted, pressures there dropped to about 40 psi. He added that is a very low pressure that can create problems for residents. Fix added that summer irrigation could also produce low pressures similar to those encountered during the fire flow tests. Fix said that irrigation of the district’s parks and open space areas was not included in the model. He added that those areas are irrigated with water from the drinking water supply and the district is not currently set up to use non-potable water for irrigation. Note: Non-potable reuse water is available from the wastewater treatment plant and is used by the Donala Water and Sanitation District for golf course irrigation, but the Triview district has not yet completed the infrastructure necessary to use reuse water within the district such as for irrigation at the park and open space areas and at Bear Creek Elementary School. Fix said the next step using the model is to develop criteria for adding booster pumps to the system to increase the pressures in the northeast part of the district into the high 60s psi. A special meeting March 22 was scheduled to discuss the criteria for the booster pumps. Director Steve Remington asked if the model could show whether there is also a water volume problem and when another well might be needed to provide sufficient water volumes. Fix said, "No. What the model shows is what is being utilized on an average day." He added that the district is currently using about 370 gallons per minute on an average day, or about 600 acre-feet per year. An acre-foot is 326,851 gallons. Director Steve Hurd’s absence was excused. Thomas Harder and Robert Fisher were noted as willing to serve in the two positions to be filled at the May 8 election. Since the number of candidates equals the number of positions available, the May 8 election was canceled. Remington reported on his research regarding street signposts throughout the district. He recommended continuing with a mix of 6-inch square redwood posts in the single-family residential areas and multi-sided brown metal posts in the multi-family and commercial areas. Triview Operations Supervisor Steve Sheffield recommended adding that policy to the district’s specifications book. It was announced that the attorney of record for the district’s 24-year-old water court case has been changed to Chris Cummins of Felt, Monson & Culichia and that a tentative agreement has been reached with the Forest Lakes Metropolitan District, which had been opposing the Triview district’s position. Representing Classic Homes, Joe Loidolt reported that Classic is currently re-planning the northern part of Promontory Pointe and the Sanctuary Pointe project. He asked the board when the next well might be drilled. Noting that the Triview district currently does not have a manager, he asked how he could get questions answered. Director Robert Fisher noted that the pace of growth is quickening but that the schedule for the next well is still under consideration. Board President Bob Eskridge told Loidolt to contact Sheffield with operational questions and to send a letter to the board for policy and planning issues. $8,780 to CEI for filter media. $7,207 to engineering consultant firm Merrick & Co. for expenses associated with modeling the district’s water supply system. $6,685 to National Meter & Automation for meter kits. Sheffield said water production of 7.5 million gallons in February was about 4 percent less than in February 2011. He also reported that divers cleaned the tank and clearwell and found both to be in good shape. They recommend cleaning the system every three years. The board went into executive session at 6:08 p.m. for discussion of employee contracts, intergovernmental agreements, and discussion of possible legal settlements. The next meeting will be held at 5 p.m. on April 10 at Monument Town Hall, 645 Beacon Lite Road. Meetings are normally held on the second Tuesday of the month. Information: 884-8017. On March 22, the Triview Metropolitan District board held a special meeting with a single published agenda item: "Set standards and make decision for booster pump." The booster pump system is being designed by engineering consultant firm Merrick & Co. to ensure adequate water pressure for the new construction in Promontory Pointe, now a development of Classic Companies Inc., and also to improve substandard water pressure in the higher elevations of northeast Jackson Creek. See www.ocn.me/v11n9.htm#monpc and www.ocn.me/v11n9.htm#bot0815 for background on Promontory Pointe. Director Steve Hurd did not attend this meeting. Triview Treasurer Steve Remington asked for a schedule amendment to add an agenda item for discussion of the intergovernmental agreements (IGA) with the Town of Monument and an executive session on personnel issues and negotiations. The motion was unanimously approved. Merrick engineer Barney Fix stated that this agenda item was a routine work session on modeling studies, including irrigation flows, and options for locating the booster pump system. The first flow model Merrick prepared for the entire Triview water distribution system did not include specific summer park irrigation flows. An average current winter flow of 396 gallons per minute (gpm) was used to calibrate the water distribution system model, which includes the daily annual average for irrigation flow. The average summer flow of 1,400 gpm (2 million gallons per day) was also used for calibrating the model. Director Steve Cox asked if Triview’s water plant A could keep up with summer demands if plant B went down. Monument Public Works Director Tom Tharnish said, "Absolutely." Director Robert Fisher said that losing a well and losing one of the two plants would put the water system in a negative state during peak season because all irrigation water is treated water. Two summers ago, Triview had to shut off irrigation of its open park spaces when there were water production problems. Cox asked if a new tank and an eventual new well would be a better investment than a booster pump system. Fisher said decisions on digging the next well and installing the next water tank "farther up the hill" also need to be made. However, the currently proposed booster pump system will immediately solve service problems in the Jackson Creek areas that already have unacceptably low water pressure and service the new houses being built in Promontory Pointe for $150,000. The proposed new 2 million gallon tank would cost Triview more than $1 million. Monument water operator Steve Sheffield directs the operation of Triview’s water distribution system under an operations intergovernmental agreement with the town. He said the existing Triview wells and pumps cannot keep the existing 1.5 million gallon Triview water tank full during periods of high demand, so another tank will not solve water pressure issues. "We’re battling against being able to produce enough water" and another well is needed to solve the summer demand production problem, Sheffield said. President Bob Eskridge added that "sinking another well doesn’t necessarily solve the pressure problem." Fisher stated that the booster pump system is a quicker, "short lead time acquisition and installation solution" and is a low-cost item that he would have chosen four years ago if it had been offered as a solution to the board, though it is less than 20 percent of the answer for overall water system expansion. Sheffield said he could not remember a time when either plant was keeping Triview from producing water—it was always a well issue. There is room for installing another well and unused capacity to treat the extra water in the B water treatment plant. Eskridge said that the booster pump, another well, and another tank are all needed. Fix reminded the board that the task contracted to Merrick was to site the booster pump and then determine where to install another tank and well. Merrick does not yet have an answer on where to put the second tank and how to pump water farther uphill to this new tank. Merrick scheduled this meeting to determine where to install the booster pump and new tank. Remington asked if the booster pump station would have any use after the new well and water tank were installed. Fix said future booster pump utility would depend on where all three new system components are installed. A larger booster pump may be needed after the new well and tank are installed and Promontory Pointe approaches completion. The piping for the pressure booster system could be sized for the long term and a larger booster pump could replace the first booster pump when additional capacity is needed to sustain water pressure throughout Jackson Creek, Promontory Pointe, and Sanctuary Pointe. Joe Loidolt, president of Classic Companies Inc., noted that Merrick’s first proposed booster pump would not have to be a "throwaway." It will be needed to help ensure adequate water pressure in Classic’s Sanctuary Pointe development—the former Baptist Camp parcel—to the east of the existing Triview water tank, if the first pump is adequately sized to also meet the further requirement to sustain pressure in the east side of Sanctuary Pointe. After the second Triview water tank is installed, farther uphill to the east of the existing Triview water tank, it will improve water pressure by gravity in Promontory Pointe and Jackson Creek below it. The planned first booster pump could be removed and re-installed in another Triview booster pump system to be installed at the east end of Sanctuary Pointe. This larger pump would also have to be large enough to sustain water pressure in this other Classic development in a location that is much farther uphill than Promontory Pointe. After further technical discussion, there was consensus among the Triview directors and Monument’s contracted water operators in attendance that Triview’s next well would have to be up and running before next summer to ensure water availability in 2013 for Promontory Pointe and the 177 Vistas apartments being constructed by Ent Federal Credit Union. The design goal is to ensure that water pressure will be 60 to 65 pounds per square inch throughout Triview. Fix said Merrick’s flow model, when completed, will help better predict how water will move through the system, but will not predict when a larger quantity of water is needed, when the new booster pump system will need help from the new water tank, or when the new well will be needed. Merrick can provide two or three options for where to install the booster pump system for existing and future problems and an analysis of how much it will cost to operate in those locations. Fix will give the board another update on April 10. A final decision will likely be made in May. The board unanimously approved an extension of all existing town-Triview’s IGAs for two months through the end of May to ensure enough time for the district to hire and cross-train people from the town staff. The start date for the town employees being hired by Triview was not changed from April 1. Sheffield, who is the Triview water superintendent under the water operations IGA, announced that he had interviewed for the town’s position of water foreman "in the interest of being transparent." Eskridge replied that he had made a verbal offer to Sheffield and had Sheffield make the verbal offers to the other four town employees as their superintendent. Eskridge added that written offers had been drafted and would be finalized and presented to the five employees. Sheffield said that he felt written offers would be "official and should have come from someone other than myself." All employment conditions including vacation and sick leave accrual will be identical. However, accrued Town of Monument vacation and sick leave must be paid out by Monument. The board went into executive session at 5:54 p.m. Note: After this meeting, Sheffield accepted the town’s water foreman position, which Tom Tharnish had held until he was promoted to fill the vacant Public Works director position. Sheffield will continue to supervise Triview water operations under one of the extended IGAs noted above until Triview selects its own supervisor. The next meeting will be held on April 10 at 5 p.m. in Monument Town Hall, 645 Beacon Lite Road. Meetings are normally held the second Tuesday of the month. Information: 884-8017. Below: Donala candidates (from left) Bob Denny, Tim Wheeler, William George, Kenneth Judd, Gene Thornton, and Gar Graham. Photo by John Heiser. Their candidate statements will be carried in the May 5 issue of OCN. The six candidates for the three board positions to be decided at the election May 8 attended the March 15 monthly meeting of the Donala Water and Sanitation District Board of Directors. William George, Kenneth Judd, and Gene Thornton, and are the candidates for the two four-year positions currently occupied by Dale Schendzielos, who is term-limited, and George, who is running for re-election. Bob Denny, Gar Graham, and Tim Wheeler are the candidates for the one two-year vacancy created when Tim Murphy resigned. In September, Judd was appointed by the board to fill the vacancy until the May 8 election. The polling place for the May 8 election is the district office at 15850 Holbein Drive. Those who cannot vote in person on May 8 between 7 a.m. to 7 p.m. may apply to the district for a mail-in absentee ballot. The district must receive requests to mail absentee ballots by May 1. Absentee ballots can be picked up at the district office until 3 p.m. May 4. Even those who have been put on permanent mail-in ballot status by El Paso County must submit a request to the district to receive an absentee ballot. The Donala district operates the Upper Monument Creek Wastewater Treatment Facility that is jointly owned by the Donala district and the Triview and Forest Lakes metropolitan districts. Dana Duthie, Donala district general manager, distributed copies of the Perspective on Our Community "Nutrients, wastewater, and why you should care" that ran in the March 3, 2012, issue of OCN. Duthie noted that the state has revised the wastewater requirements so that for plants that have a capacity of less than 2 million gallons per day (mgd), compliance with the new nutrient standards will be delayed 10 years. The Upper Monument currently has a capacity of about 1.75 mgd and currently is operating at about 40 percent capacity. Duthie said that total inorganic nitrogen (TIN) in the effluent from the plant is currently running about 6 mg/liter but at full plant capacity will likely be near 10 mg/liter. Compliance with the proposed limit of 7 mg/liter would require a substantial plant expansion and potentially more sophisticated treatment. He noted that there are significant constraints on further plant expansion due to protected mouse habitat near the plant. He added that limitations on the expansion of the plant and required compliance with the anticipated nutrient standards will constrain growth in the Triview district. There have been numerous problems with the blowers at the wastewater plant. Duthie reported that three blowers are currently operational although two have minor oil leaks. The newest blower has been dismantled for shipment to repair its oil leaks. Insurance is reimbursing $31,000 for three of the blower failures. Duthie noted that if a conservation easement is placed on the Willow Springs Ranch, it would eliminate the most attractive water reclamation options identified by the Donala Extended Water Supply Study (DEWSS). During the three months from Dec. 1 through Feb. 29, the district’s $3.19 million in investments managed by Davidson Fixed Income Management showed a yield of 0.32 percent, achieving a goal of beating the Colotrust Plus fund, which yielded 0.04 percent during the same period. The weighted average maturity of the district’s investments is 7.6 months. Davidson also separately manages $5.6 million in proceeds from the bond sale to be used to fund the infrastructure improvements needed to handle renewable water and $596,431 in a debt service reserve fund associated with the bond sale. Duthie reported that toward the end of March, the district will solicit bids for the first part of the infrastructure upgrades needed to transport larger amounts of renewable water from the southern part of the district to the northern parts. The initial work will install larger pumps at the Latrobe and Jessie facilities. That will be followed by installation of a new pipeline from the Jessie facilities up Baptist Road and upgrades to other pipelines in the district. The work is to be completed by the end of 2013. 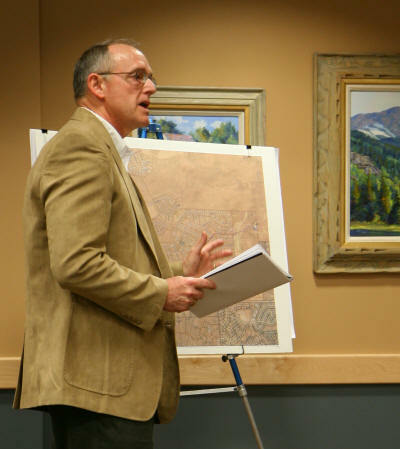 Duthie reported on the March 15 meeting of the Pikes Peak Regional Water Authority (PPRWA). He said the Super Ditch test project, originally planned for 500 acre-feet per year, has been scaled back to 250 acre-feet with 125 acre-feet each for the cities of Fountain and Security because the Southeast Water Conservancy District has blocked participation by the Cherokee and Woodmen Hills metropolitan districts. An acre-foot is 326,851 gallons. He added that funding the transit loss model continues to be a focus of attention for the PPRWA. Donala’s share of the cost for the model is $16,358 per year. Duthie said there is currently no benefit to the district because it does not have a customer for its share of the effluent from the wastewater treatment plant. Note: The transit loss model measures and records the amount of non-native Fountain Creek watershed stream flows owned by several municipalities and water districts. The amount of this water added to native stream flows by external sources, such as effluent from wastewater treatment facilities, can be exchanged or reused. The model calculates how much of the added water is lost. Duthie reported that the "Twelve Hours of Donala" wounded warrior charity event March 8 raised more than $900. Following the public meeting, the board went into executive session to discuss personnel issues. The Donala board will hold its next regular meeting April 19 at 12:30 p.m. at the Donala office, 15850 Holbein Drive. The April meeting will be Dale Schendzielos’ last meeting as a board member. There will be a buffet at the beginning of the meeting. Meetings are normally held at 1:30 p.m. on the third Thursday of each month; however, no meeting will be held in November 2012, and the December 2012 meeting will be held Dec. 6. Academy Water and Sanitation District engineer Roger Sams gave board members at the April 4 meeting another look at options and numbers that he prepared to address compliance issues with current and future wastewater regulations. He said the district’s lagoon system, which treats wastewater, cannot meet the state’s current ammonia standards and will not meet new regulations that, 10 years from now, will dictate phosphorus and nitrogen limits in the effluent (the treated water that is released into Jimmy Smith Creek). Sams first briefed the board in October, and his updated preliminary report reviewed costs of construction to meet effluent standards in the same three scenarios: connecting with Colorado Springs Utilities, connecting with Donala Water and Sanitation District, and building a sequencing batch reactor plant where the lagoons are located on Spring Valley Drive. The price tag ranges from $2.4 million to $3.7 million, not including operational costs. Those numbers, along with estimates of user fees, will be prepared and presented at the May meeting. Carole O’Mara, a homeowner in the district, spoke to the board about her and her husband’s petition to be excluded from the district. A well that taps into the Denver aquifer serves their home, but because the previous owners of the home had "included" into the district, the O’Maras have had to pay taxes on the district’s bond issue, as other district residents do. The O’Maras have been requesting exclusion for several years, but their effort has intensified over the past year. Carole O’Mara was frustrated at how long the process has taken. "Every time we come to a meeting, the board says it’s going to take it up in session, and it doesn’t happen," she said. The issue is legally complicated. "We’ve been trying to understand the impact of your request on our customer base," said Director Ron Curry. "Things have been going on in the background .... It’s a slow process." The board went into executive session to get legal counsel on the dispute. Afterward, the board voted to publish a public notice in The Gazette indicating the board would take a vote on the matter at the May issue, which is required by law. The Academy Water and Sanitation District board usually meets at 7 p.m. the first Wednesday of every month at the fire station on Sun Hills Drive. The next meeting is May 2. On March 5, the order of appearance of the names of the four candidates competing for three seats on the Monument Board of Trustees was set. The board approved an ordinance that authorizes CenturyLink to build a fiber-optic cable TV network within the town limits and tabled a proposed ordinance setting tighter restrictions on the parking of recreational vehicles in residential areas. Trustee Jeff Kaiser did not attend this meeting. Trustees Tommie Plank and Gail Drumm are term-limited. Trustee Rafael Dominguez chose not to run for a second term. The three trustees elected on April 3 will be sworn in on May 21. Also on the ballot was a question for another four-year renewal of the town’s TABOR exemption that, if approved again, would allow the town to retain any excess taxes and use them exclusively for town parks and recreation or senior services. There has never been excess tax revenue in all the years the TABOR exemption has been in force. See ballot results. Triview Metropolitan District Board Treasurer Steve Remington thanked the Board of Trustees for its "very professional" support of Triview during his four-year term, which expires in May. He said the Board of Trustees "always had the best interest of the residents at heart, even if we didn’t agree what that was, and everybody was trying to do the right thing." Remington specifically thanked Mayor Travis Easton and Trustee Rafael Dominguez for their participation in small group discussions to achieve consensus on solutions for Triview problems. He also thanked Town Manager Cathy Green and Town Treasurer Pamela Smith for "a lot of extra work" while they voluntarily managed Triview. Easton thanked Remington for his service to Jackson Creek residents. Remington is not running for re-election. CenturyLink representative Mike Burnett, southwest regional vice president and general manager, provided a summary of the services and infrastructure his company intends to construct to provide cable TV service to this region. He noted that CenturyLink has completed its acquisition of Qwest and proposed the same 3 percent franchise fee that Comcast already has with the Town of Monument. There was no public comment on the ordinance. It was approved 5-0-1, with Gail Drumm abstaining. Drumm said he had not had time to review the franchise agreement. A specific start date for local construction of the new cable network has not been established. Green introduced the proposed amendment to an existing regulation for parking spaces specific to recreational vehicles, saying the town staff was responding solely to citizens’ complaints about RV parking issues. She said, "We didn’t sit in our offices and dream up another thing to write an ordinance about. It’s actually become a neighbor problem. People are complaining that their neighbors park boats everywhere. We’re trying to find a fair way to handle it so that the neighbors that have to look at them are not upset and the people that own the boats and the vehicles have an adequate place to store them." There was a lengthy discussion by the trustees of what Green said was the board’s current policy of only having the town’s code enforcement officer respond to complaints regarding vehicles not stored in back yards, the staff’s proposed code revisions, and open storage of valuable and classic vehicles. Green said that the amendment was not drafted in response to "100 people complaining once, but two to three people complaining 100 times" and demanding to "see in black and white why my neighbor can do that—and currently the code would allow it." "6. A recreational vehicle is permitted only on a driveway or adjacent and parallel to a driveway on a single-family residential lot, or in the paved parking lot of a multi-family residential community. In a single-family residential district, the recreational vehicle must be parked on the side of the driveway closest to the property line, or close to the house within the side yard, space permitting. If parked in the side yard, the recreational vehicle shall not extend more than five feet in front of the house’s front building line, excluding porches and/or stairs." "7. The recreational vehicle must be parked on a hard surface such as, but not limited to, asphalt, concrete, rock, gravel, or pavers. The area must be specifically designated for parking use and must be properly maintained. Parking on any grass and/or dirt area is prohibited." What part of the vague language in the existing written code should be enforced, such as whether a worker’s trailer can be or should be treated the same as a boat trailer. How the code could or should be enforced with consistency in areas with no homeowner association covenants. Whether to continue the board’s policy of completely ignoring existing code restrictions on backyard storage unless there is an erosion or stormwater runoff issue caused by RV storage that extends past the RV owner’s property line. The board continuing to ignore the pollution caused by various RV petroleum products and other toxic fluids leaking onto the ground. The board continuing to ignore the negative effect that having the staff avoid code enforcement has on neighbors’ property values. Cleaning up some neighborhoods in town. You have homeowners associations (HOA) that have 90 percent of the people, so why are a few wanting to come and get the whole town to restrict their neighborhood instead of them just forming their own HOA. This will affect personal property rights—people being able to bring home what they want to, drive what they want to, park where they want to. Now you are trying to restrict my neighborhood from allowing work trucks or whatever people want to drive home because some person somewhere does not like it in their neighborhood. The people that have lived here for a long time are the ones who have liked it the way it is. Where is it that we should start changing their lifestyles because we are new? Why do you care what side of the house they park on? Why can’t they put pavers down on the other side of the yard? A motion to table the amendment was approved by a 5-1 vote, with Drumm opposed. Green said she would have Town Code Enforcement Officer Cindy Sirochman prepare a briefing on the issue for a future board meeting. Kassawara will present the negotiated contracts at a future meeting for board approval. Green said that Mayor Easton and some trustees wanted to have another discussion about the sprinkler requirement in the International Fire Code and current regulations that apply this rule only to new homes over 6,000 square feet. She said that the Pikes Peak Regional Building Department is not enforcing the International Fire Code automatic sprinkler installation requirement and has asked the town to remove the portion of the code on sprinklers from town regulations. Town Attorney Gary Shupp said that since the town had adopted the International Fire Code by ordinance, dropping the sprinkler part of the code should also be done by ordinance. Drumm said he got a call from the Housing and Building Association (HBA) regarding HBA’s concerns about fire districts wanting to enforce automatic sprinkler codes that HBA objects to. . The fire districts "want it in every house eventually," he said, and want to inspect the systems annually. Regional Building has said it will not support the sprinkler requirement. Easton also expressed concern about whether all eight fire districts in north El Paso County have the same regulations if fire circumstances differ. Green noted that sprinklers are a life safety system that ensures that people can get out of a building well before any fire trucks or ambulances arrive. Drumm countered, saying Regional Building "can’t find just cause for the expense or the maintenance of, or the damage of such a sprinkler system, whether it is operating or not operating, whether it froze or broke and just comes on and ruins everything in your house." He also cited problems with heating water tanks and preventing systems from freezing in the winter. "We’re not sure why they (the fire districts) want it." Dominguez replied, "It’s a union thing." He asked if the town had spoken to the Tri-Lakes Monument Fire Protection District to understand whether that district can arbitrarily impose the International Fire Code. Green said no. Kassawara noted that there are no homes in Monument over 6,000 square feet, but calculations must include garages, basements, and covered patios in the square footage. He added that even if it were only applied to homes of more than 6,000 square feet, the automatic sprinkler system rule might still affect house construction in Monument in the future. There was board consensus to have the staff prepare an ordinance to exempt the town from the sprinkler requirement for any building, including any new ones over 6,000 square feet. Drumm announced that Regional Building had given him a $5,000 check as a grant for the town to use to develop new jobs and thus stimulate new housing and commercial construction. Easton suggested that the town work with the new Monument Economic Development Corp. to develop a plan to use the grant. The $5,000 check will be deposited in the board’s contingency fund to avoid taxation. In other matters, the board unanimously approved an annual renewal of the liquor license for the Jasmine Garden restaurant at 1425 Cipriani Loop and Treasurer Pamela Smith’s January financial statements. Water Superintendent Tom Tharnish had been selected to fill the vacant Public Works director position. Green noted that Tharnish will be required to relinquish his side business of operating several other small water districts. Town Clerk Scott Meszaros had accepted the position of town administrator for Meeker, Colo., effective April 1. An open house would be held at Town Hall on March 22 for downtown business owners to discuss elimination of angled parking on Second Street in front of the Monument Sanitation District building and parking plans for the abandoned Police Department property on Washington Street. A community meeting would be held at Town Hall on March 15 about the county Parks Department taking ownership of the Willow Springs Ranch parcel as a county park. The abandoned Triview Metropolitan District stormwater pipes behind the Walmart in Monument Marketplace can probably only be removed by helicopter from the Preble’s mouse habitat. Note: The town’s senior planner position remains unfilled, as does Triview’s district manager position. On March 19, the Monument Board of Trustees approved an ordinance to amend the existing town code regarding "exclusive use for parking spaces specific to recreational vehicles." Cindy Sirochman, the town’s code enforcement officer, gave a slide presentation showing photos of RVs parked correctly and incorrectly within the town limits. She noted that the definition of an RV includes travel, tent, trailer, boat, cycle, utility, or horse trailers; detached pickup camper or coach, motorized dwelling, boat, snow vehicle, or similar vehicle or equipment. Sirochman quoted each phrase of the new town code language, explained its purpose, and showed pictures of what is meant to be achieved and avoided. Some of the items she discussed and showed pictures of are noted below. Sirochman said the current code restricts parking of any RV on a driveway, parking lot, or other paved surface, not including gravel, on the property. The new paragraphs are less restrictive. For example, sideyard parking is added as an option in the amendment. While some homeowners associations (HOA) prohibit on-street parking, the code will allow on-street parking for up to 24 hours, while still limiting obstructions to town snowplows. The proposed amendment would allow RVs to be parked on the side of the driveway closest to the property line or parallel and adjacent to an existing paved driveway on a single-family residential lot. This change is designed to prevent damage to existing curbs and sidewalks and ensure that parked RVs remain aesthetically pleasing—not scattered throughout a property—to protect adjacent property values. She added that few residential lots have a second curb cut on the other side of the front yard, away from the paved driveway. Routine driving over a curb and adjacent sidewalk to park an RV will be prohibited. The two new code paragraphs are quoted in the March 5 BOT article. Sirochman noted that she had received two RV parking complaints in the second half of 2010, six complaints in 2011 (only three were valid), and one complaint in 2012. During public comments, county resident Dan O’Reilly of Fox Run said that an RV usually cannot be activated for a trip or deactivated afterward in only 24 hours. Town Manager Cathy Green said the 24-hour limit is fairly standard, but she did not know what that time limit is based on. O’Reilly said it is based on people who do not own RVs, to some laughter. There was a lengthy discussion of the same issues raised by some trustees at the March 5 board meeting. Sirochman discussed several examples of how she has used flexibility in her "complaint-based" approach with citizens, showing pictures of large boats blocking traffic sight lines and "used car lots that continue from house to house on the grass area." She noted her constant consultation with Green to resolve problems within the policy adopted by the board before she was hired as code enforcement officer. As she moved from photo to photo of violations, she asked the board for guidance on whether each situation should be "grandfathered" but received no answers on these situations, which she said were "political issues." Sirochman said more problems occur in "old town" than in Jackson Creek, which still has some active HOAs. The town does not enforce HOA covenants, and she does not enforce standards in rear yards, unless she receives a complaint and only after discussing these specific backyard complaints with Green, even though there is no written waiver or policy. There are numerous RVs, campers, and boats parked on the grass or dirt in back yards throughout town. Trustee Gail Drumm said "new people" should not run the town and change policies that longtime residents came to Monument for in the first place. He again gave his traditional arguments about being confused about what each word in new code paragraphs means, that Sirochman’s pictures were confusing, that people have a lot of stuff that needs to be stored in their back yards, and that most curbs do not have cuts for driveways. Sirochman repeated the same words she had written on slides to explain each issue to Drumm a second or third time. Drumm reiterated that HOAs, not the town, should enforce codes. Trustee Rafael Dominguez argued for a simple "all or none" approach for consistency and the need to prevent "horrible-looking back yards" in plain sight with only split-rail fences. Trustee Stan Gingrich said he was in favor of consistency in ordinances with discretion in enforcement. He was opposed to the cost of having to put down hard surfaces where RVs are currently parked on grass or dirt. Town Attorney Gary Shupp said that RV complaints are generally handled in the same common sense approach in court as noise and barking dog complaints. Some trustees supported having rules on the books to protect the property values of those with bad neighbors. Sirochman said that she would not have enough time to continuously enforce the town code proactively and "go hardball" to enforce every regulation. She asked the board to clarify what "complaint-based enforcement" means to this particular set of trustees, suggesting the current Colorado Springs Police Department policy of "reactive-only enforcement." She said she needs a written code for negotiations during enforcement. She noted that about 90 percent of RVs are already parked on gravel and most of the problems would go away with approval of the proposed amendment. Mayor Travis Easton polled each trustee to have them declare for proactive or reactive-only enforcement. Green asked board members opposed to driveway restrictions if it is always OK to park an RV anywhere in a front yard. After an hour of discussion that did not reach consensus, a motion to approve the amendment as written—with no decision on a complaint-based or proactive policy approach to enforcement specified—was approved 5-2, with Drumm and Gingrich opposed. The board unanimously approved an ordinance amending the town code to exempt the town from Section 903 section of the 2009 International Fire Code that requires automatic sprinkler systems in new construction. There was no public comment. No rural fire district personnel or board members attended the meeting to speak in support of any automatic sprinkler system requirement in the International Fire Code. The Tri-Lakes Cruisers Car Club’s application for its 11th annual car show on June 12 was unanimously approved. The show will close off an additional section of Washington Street on the south side of Second Street, down to the first residential buildings. The show will also close Second Street from Front Street to Jefferson Street and Washington Street a half block on either side of Second Street. The closure lasts from 6 a.m. to 4 p.m.
Mayor Easton and Trustee Gingrich abstained in each of the four 5-0-2 votes of approval. Two liquor licenses were unanimously approved. A new license was approved for a new restaurant called Fuji Mountain Japanese Cuisine being built at 16064 Jackson Creek Parkway. A special liquor license was approved for St. Peter Catholic Church for its school and parish "Hoe-Down" to be held for parishioners only from 5 to 10 p.m. on April 22. In other matters, the board unanimously approved Treasurer Pamela Smith’s January sales tax report. Trustee Jeff Kaiser asked about progress on management issues with Triview Metropolitan District. Green said the Triview board might not be ready to operate independently by March 31. It has made job offers for a district manager and to hire some town employees who had been working for the district under intergovernmental agreements. Kaiser asked Drumm if he had any updates on his gathering of data on town cemetery operations and his cemetery master plan. Drumm said he had not heard anything and did not have anything for the board to look at. Trustee Tommie Plank said she went to the "very well attended" El Paso County open house in Town Hall on March 15 on converting the Willow Springs Ranch to a county park. The county will be proceeding on obtaining funding to purchase the property. Mayor Easton asked the staff if it could offer any spare office equipment to the Town of Green Mountain Falls, noting that an arson fire destroyed its town hall. Easton said he met earlier in the day with several other regional mayors in Denver to discuss an agreement with the Colorado Department of Transportation (CDOT) regarding a memorandum of understanding on the amount of state funding the region should be receiving—9.5 percent of $1 billion annually instead of the current 4 percent. The 11-person board for this region’s CDOT transportation district is being reapportioned. This board only has one commissioner representing the Tri-Lakes region. El Paso County is the most populous county. Easton noted that CDOT had made its first reimbursement payment, $3 million, of the $16 million the state owes the Baptist Road Rural Transportation Authority for widening of Baptist Road east of the I-25 interchange. Easton asked consensus on supporting the addition of a direct flight by Frontier Airlines from Colorado Springs to Washington, D.C.
Tom Kassawara, director of Development Services, reported that seven or eight qualified applicants had applied for the town’s vacant planner position. Easton asked, "Is it a needed hire right now?" Kassawara replied that several applications for new building are pending. Drumm said, "I think you need to leave the job open for six months and see where our economy is going with the dip in our sales tax." Kassawara also noted that the Fountain Creek Watershed Flood Control and Greenway District is looking for funding for a development study, but no major activity in drainage projects is planned in the short term. External grants will be needed for such a large project. Each member of the district would receive a piece of the grant money for its own drainage projects. Tharnish asked if there were any questions on his initial written reports as Public Works director. The board said the length and detail of his reports amounted to a good summary. Dominguez asked Police Chief Jake Shirk about speeding on Second Street that had been reported to him. Shirk said he had received no complaints about any speeding. Green said it is hard to speed with all the stop signs. Green said the Triview board was making a good faith effort to successfully split apart from the town staff. Triview is short several vehicles it needs. Green distributed a worksheet on tax revenues of towns and special districts in the county. Green noted that this would be Scott Meszaros’ last board meeting as town clerk. "He is going to be the town manager of Meeker and all the elk are scared," referring to his avid pursuit of hunting. Green said he had done an "incredible job" in organizing the town’s records and conducting the office in a professional manner. 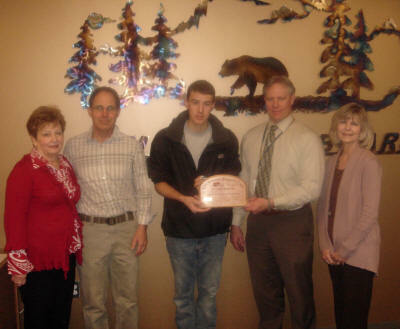 Easton presented a plaque to Meszaros for his service to the town. Below: At the April 2 Monument Board of Trustees meeting, new Monument Town Clerk Cindy Sirochman was sworn in by Town Attorney Gary Shupp. Below: Monument Police Department Chief Jake Shirk (right) swore in his newest police officer, Andrew Romano. Also participating in the ceremony (left to right) were Lillian Romano (sister), Dominic Romano (father), Catherine Romano (mother), Julianna Romero (sister), and Denise Perez (friend). 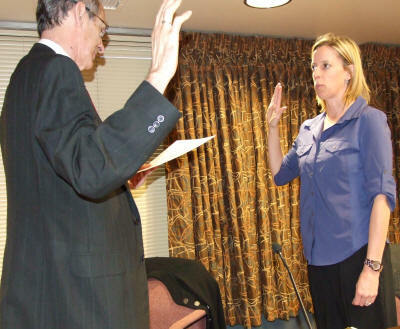 On April 2, Cindy Sirochman changed job titles from Monument’s code enforcement officer to town clerk, replacing Scott Meszaros. She was sworn in by Town Attorney Gary Shupp. Officer Andrew Romano was sworn in by Monument Police Chief Jake Shirk. His mother, Catherine Romano, pinned on his new badge. Chief Shirk said, "In the seven years I’ve been here, to the best of my recollection, this is the first time that I have ever received a phone call from the police chief of the academy where it was highly recommended that I should consider this young, young, young, young gentleman as my police officer. He tested with us and did very well and it is my honor to hire him as our newest police officer." Mayor Travis Easton stated that the absences of Trustees Gail Drumm and Jeff Kaiser were excused. Easton stated that he had met with officials of Lewis-Palmer School District 38 to organize a student council liaison group. The group will help students shadow town staff and trustees or serve as interns to gain real-world experience in performing service projects. Carol DeBlois and Gloria McCartan, officers of the Palmer Lake Fireworks Committee, asked the board for approval to have their group’s annual request letter for donations for the volunteer Fourth of July display inserted into the envelopes of the Town of Monument water bills. The board approved this distribution. Betty Konarski, the town’s representative to the Pikes Peak Regional Water Authority, gave each of the trustees a copy of the winter issue of Headwaters Magazine, which is published by the Colorado Federation for Water Education (www.yourwater.org). She stated that they should learn about water issues and that Gov. John Hickenlooper declared 2012 to be Colorado’s Year of Water at this year’s annual Colorado Water Congress (www.cowatercongress.org) convention in January. She directed their attention to the project’s brochure that was inserted as its centerfold. Easton asked Konarski to describe some Year of Water events. She again referred to the brochure (www.water2012.org) in Headwaters. This website has a daily calendar of events related to water for the year. She also said the governor’s goal is to develop the first formal state water policy in the next two years. She represents El Paso County on the planning board for the Flaming Gorge task force that is analyzing how to import water to Colorado’s South Platte and Arkansas River basin by 2050, which she said is a necessity that is inevitable. Konarski said Tri-Lakes is one of the most vulnerable parts of the Arkansas basin because it is so far from renewable surface water and totally dependent on non-renewable Denver Basin groundwater. See www.water2012.org/get-involved.html for more information on how to participate. As the representative of the Tri-Lakes Views public art site organization (www.trilakesviews.org), Konarski also gave a slide presentation of the 11 art pieces that will be displayed this year on pedestals in this area. Her group has received a $2,000 grant from El Pomar Foundation and a private donation that will be used for three new public art display pedestals. The artists who will have work displayed this year come from Colorado and Arizona. She thanked the board for its continuing support of the arts. The board unanimously approved an annual liquor license renewal for Columbine Gardens Restaurant at 481 Highway 105, No. 201. The board also unanimously approved Treasurer Pamela Smith’s February financial reports. Expenses were less than revenues for the various funds. No debt payments have been made yet this year. Town Attorney Gary Shupp reported that the Brody lawsuit against the town for encroachment issues on his vacant lot on the southeast corner of Front and Third Street had been "dismissed by stipulation." Town Manager Cathy Green announced that the Health Advocacy Program (HAP) is searching for seniors who are isolated and in need of Meals on Wheels service. HAP would like to expand its program and reach people in more distant rural areas who may not know where to go to ask for help. Green also said there had been good progress in separating Triview Metropolitan District operations from the town staff. Some furniture will be moved on Friday, April 6, to set up a new rear first-floor office in Town Hall for the town employees who will be transferring to Triview for employment. Some holes remain to be filled in the new Triview staff. The goal of shifting all operations by April 1 has been pushed back three weeks. Trustee Rafael Dominguez asked Green about timelines for landscaping on Second Street and paving of the vacant former Monument Police Department lot on Washington Street. Tom Kassawara, director of Development Services, said there would be another meeting on striping for Second Street parking spaces on April 5, and the budget for paving the vacant police lot was $15,000. Site cleanup and grading by Public Works staff should be completed by April 12 to allow a pre-bid meeting and bid process for asphalt contractors to pave the Washington Street parking lot. He said the winning bid will likely be a little bit more than $15,000, requiring board approval to find the additional needed funding from other budget lines. The landscaping is also in the Public Works budget. Trustee Tommie Plank suggested that the board consider making a contribution to Tri-Lakes Views for its contribution to downtown vitality. The staff will present a list of options at the next board meeting on how to use the $1,300 remaining in the board’s contingency fund. The meeting was adjourned at 7:02 p.m. The next meeting will be held on April 16 at 6:30 p.m. at Town Hall, 645 Beacon Lite Road. Meetings are normally held on the first and third Monday of the month. The Tabor Exemption ballot question passed by a vote of 307 (yes) to 204 (no). On March 8, the Palmer Lake Town Council voted unanimously to cancel the 2012 election, which had been scheduled for April 2. Economic Development Trustee Michael Maddox was excused from the meeting. No nominations were received for the six open positions for mayor and council members. Economic Development Trustee Michael Maddox and Fire Trustee Rich Kuehster are the only council members who would continue, because they were appointed in 2011. The Roads Trustee position has been vacant since Dennis Stern resigned. The mayor is the only term-limited position on council. Mayor John Cressman will complete his second consecutive term in April. The next election is scheduled for 2014. If any of the present trustees are still active on the council, they will be officially removed at that time unless they are replaced or are reappointed prior to that election. Because the April election was canceled, the positions will be filled by appointment. Cressman said he "brought this problem to light through interviews with The Gazette and Channel 5." He said he "hoped citizens would harken the call and volunteer for these positions. It is a big issue, with a multitude of reasons why interest has not surfaced." He added that serving on the council "takes a lot of time and people are working." Cressman said he "hopes it is the time commitment and not apathy" contributing to the lack of interested candidates. He requested that council members solicit interest from Palmer Lake residents. The lone visitor at the meeting was Gerilyn McGaughran, who spoke about her interest in becoming a council member. She said she did not know about the election, was intrigued by the article in The Gazette, and is very interested and would like to pursue it. McGaughran has a background in project management and "loves this town," having lived in Palmer Lake since 2006. Water Trustee Max Stafford said the town used 3.7 million gallons of water in February, with only 99,000 gallons from the wells. The total amounted to 800,000 gallons less than was used last February. He attributed this reduction to improved water plant efficiency such as not having to rinse the filters as often and fixing leaks. Stafford said 11.1 acre-feet of renewable surface water came through the plant. Treatment expenses for this surface water are expected to be cheaper by "a factor of 10" than the treatment of the well water that was used while surface water treatment was unavailable. Town Clerk Tara Berreth said the plant has not been online a full month, so electricity use cannot be assessed yet. Cressman said he signed the final payment for the water plant upgrades. Stafford encouraged council members to have a water ordinance in place before the irrigation season begins. Police Trustee Nikki McDonald said the Palmer Lake Police Department had 19 case reports in February. One case included a juvenile girl who was reported missing and feared to have committed suicide. She was eventually found at a friend’s house in Colorado Springs. Sixty-six incidents were considered high risk. Overall, the department responded to 173 calls for the month. Park Trustee Gary Coleman said Jack Anthony, in association with Palmer Lake Historical Society, wants to place the Palmer Lake Star on the list of historical places and state historical properties. Coleman said Anthony is communicating with the state to get this listing process completed. Fire Trustee Kuehster reported that the Palmer Lake Volunteer Fire Department (PLVFD) had 18 calls in February and has had 56 calls for the year. The volunteer hours for the month were 2,536 with a total of 5,477 volunteer hours for the year. Kuehster said it "is a pretty active fire department." The PLVFD participated in training for ice rescues with the Larkspur Fire Department. Kuehster invited everyone to the April 8 pancake breakfast. It will be held at Town Hall from 7 to 10 a.m. McDonald said the Easter Egg Hunt is scheduled for April 7 with a tentative start time of 10 a.m. The time might change to avoid conflict with another egg hunt in the area. During public comments, the town’s accountant, Linda Ousnamer of Pencil Pusher Inc., said that all town departments, with one exception, were under budget. She said this was a positive sign, given that insurance and memberships are paid in January. However, the town needs to monitor the police budget, she said, and offered to meet with McDonald, Chief Kieth Moreland, and Berreth to assist in increasing an understanding of the department’s budget. Ousnamer said the department’s vehicle repair, gas, and payroll costs have increased. The meeting adjourned at 6:56 p.m. The next meeting will be held at 6:30 p.m. April 5 in Town Hall, 42 Valley Crescent. Meetings are normally on the second Thursday of the month. Information: 481-2953. At a meeting March 15 at Monument Town Hall, residents expressed support for an El Paso County plan to preserve Willow Springs Ranch as open space. The 260-acre ranch is south of Monument and west of I-25. The property is owned by Hillcrest Bank in Kansas City, which foreclosed on the property in 2010. In 2011, the county expressed interest in the ranch for open space. El Paso County Parks and other community partners have been researching ways to conserve all or part of the ranch for open space or community recreation. A Zoning Concept Plan including development of 450 residential lots has been approved for the property. The county wants community input on how to move forward with the ranch property considering these two options. Discussions with Colorado Springs have been ongoing over the past year, and County Commissioner Darryl Glenn said, "We are serious about working regional partnerships." Glenn also said he wants the community to be involved in creating a solution. Potential stakeholders include El Paso County, Great Outdoors Colorado, the Town of Monument, the City of Colorado Springs, the Palmer Land Trust, Tri-Lakes Youth Sports, Lewis-Palmer School District-38, Synthes Inc., and the Trails and Open Space Coalition. Tim Wolken, director of county Community Services, said the community has shown interest in the benefits of preserving the ranch to provide visual relief for the I-25 corridor, provide connections to the Pike National Forest and Santa Fe Trail system, protect water, preserve the riparian habitat, preserve wetlands, and provide opportunities for community recreation. Purchase the entire parcel for multi-use. Purchase the southwest portion of 50 acres for multi-use. Purchase the northern 66 acres plus the protected mouse habitat of 117 acres for open space. Purchase the northern 66 acres plus the mouse habitat for multi-use and open space. If the open space and park proposal moves forward, Wolken said, the money to purchase the land would not come from taxpayers. Funds from regional park fees paid by developers, lottery funds, and donations would be used to buy the land. Several residents stated that this is a chance to preserve the open space and that the county should not allow the land to be sold to another entity. Others said this is a unique opportunity for the future of the community to preserve open space, vista, wildlife, and recreation. The majority of community members were in favor of purchasing all the land and to be prompt in reaching a decision. For further information, please contact Wolken at timwolken@elpasoco.com or 719-520-6981. If all goes as planned, by the end of the summer, Fox Run Park will be showing off some new features, according to county officials who displayed the plans at an open house at the Wescott Fire Station on March 5. More than two dozen people perused the posters detailing the improvements, which are being paid for with regional park fees. A 5-acre off-leash dog park at the southeast end of the park, off Stella Drive. It will be surrounded by a 6-foot fence, with a 250-foot buffer between the fence and the road. Pet owners will be expected to pick up after their pets; though bag dispensers will be provided, the bags will not, so donations of bags will be encouraged. Park staff will empty the waste receptacles as part of their routine maintenance. Improvements to two bathrooms. These include stainless steel toilets, automatic faucets, composite countertops, energy-efficient lighting and ventilation, and metal roofs, as well as upgrades to the septic system’s leach field. Two road paving projects: the first 85 feet of the park entrance off Stella, including making it more accessible to larger vehicles such as school buses; and paving the Roller Coaster Road entrance just north of Stella. Improvements to a 2,700-foot section of the trail that starts at the Roller Coaster parking lot. In addition, a Fox Run Regional Park Friends Group is being formed to gather residents interested in donating time or money to improve the park. The first meeting is planned for June 13 at 6:30 p.m. at a home in Monument. Dana Nordstrom, community outreach coordinator with the Parks Division, said she hopes the group "will create stewardship, volunteerism, and donations for the projects and maintenance" for the park. For more information about the meeting, and to RSVP, e-mail her at dananordstrom@elpasoco.com. During the March 28 meeting of the Woodmoor Improvement Association (WIA) board, Director of Forestry Eric Gross reported on increased tree-related planning and activity. Gross reported that residents are beginning to request lot evaluations for evidence of mountain pine beetle activity and with an eye toward fire prevention. Trees in the area have been stressed by the dry weather in March, and next year may prove to be a year of high beetle activity if the dry spell continues. Another pest, the red turpentine beetle, which strikes near ground level on trees, is also in evidence this year. Gross reported that he had spoken with his counterpart in the Black Forest area and can supply literature about evidence of beetle activity and schedules for chipping services to all residents. WIA’s Chipping Day will be on May 19, and all arrangements have been made for that event. President Jim Hale reported that the association hopes to improve its web page to offer more up-to-date information on meeting dates and other matters. He also reported that he was concerned about dry conditions and confirmed with Woodmoor Public Safety (WPS) Chief Kevin Nielsen that the association receives emails about changes in fire danger ratings for the area. Treasurer Nick Oakley reported that the association’s expenditures were 2.1 percent below budget. Director of Woodmoor Public Safety Paul Lambert said that the replacement of many original cedar roofs mitigates fire danger to an extent, but expressed concern about vacant houses and construction materials around sites where home improvements are under way. Homeowners are also warned against an accumulation of slash and dry grass near homes. Nielsen reported that vandalism has increased during spring break and that there has been a report of fireworks activity. He stressed that there is a zero-tolerance policy on fireworks in Woodmoor. He also reported that WPS is monitoring speeding on the neighborhood roads. Director of Architectural Control Anne Stevens-Gountanis reported that there were 17 building projects during February and that there were an increasing number of proposals for mother-in-law suites added to homes. The committee is proposing a limit of 1,200 square feet for such an addition. Hale responded that a homeowner should be limited only by whether he is within county determined limits. Director of Common Areas W. Lee Murray reported on continued improvements to the barn and the scheduling of the Great American Clean Up for May 12. Director of Covenant Control Darren Rouse said there were 59 reported violations during April, largely involving parking and dogs. He said that he will address the rules on these two issues in the next newsletter. Vice President Kirstin Reimann and Association Manager Matt Beseau were absent and excused from the meeting. The Board of the Woodmoor Improvement Association meets at 7 p.m. on the fourth Wednesday of the month at the association’s Barn, 1691 Woodmoor Drive, Monument. The next meeting will be held on April 25. Harriet Halbig may be reached at harriethalbig@ocn.me. The Non-Profit Council, an arm of the Tri-Lakes Chamber of Commerce, held a meeting March 5 on guidelines for hiring unpaid interns. Attending this meeting were representatives from a museum, a bank, churches, a health advocacy partnership, a women’s organization, and a consultant. All were seeking ways to utilize volunteer help to make their businesses and organizations more effective. The council was established in 2008 to aid nonprofit groups in organization and operation. Since that time, it has hosted several general-interest programs. Jobs are scarce for recent college graduates. Internships offer them experience that can help in their future employment. Many colleges in Colorado offer an abundant supply of accounting, business, IT, and marketing students. Today’s students grew up with computers, mobile phones, and social media. They are able and eager to utilize this knowledge for an organization. Studies show that 35 percent of employers’ full time entry-level college hires came from their internship programs. Hiring an intern can allow a nonprofit to work on initiatives that have been put on the back burner. Conter explained the steps needed in creating an internship program. The first of these is drafting the job description. During this process the nonprofit can determine the focus of the job. Among the aspects of the description are a reimbursement plan (students may appreciate being reimbursed for their mileage), scheduling and daily responsibilities, evaluation procedures, provisions for phone use and email, and orientation. Some tasks may be done outside of the office setting. These include web page design and grant research. Interns should be scheduled to check in with their supervisors on a regular basis. In some cases, more than one intern may share a project. Conter stressed that organizations must be aware of legal requirements. Among these are stipulations that the students do not displace regular employees, they are not entitled to wages, and they are not guaranteed employment as a result of the internship. Training must be similar to that received in a vocational school (interns should not be answering phones or doing other menial tasks), and workers’ compensation insurance is not required. Conter enumerated colleges in the area and the expertise offered by their students, websites on which a nonprofit could post positions, and how to screen applications before interviewing candidates. At the end of the internship period, Conter recommends doing an exit interview with the intern, asking for a testimonial to be used in finding a future intern, and providing a letter of recommendation as appropriate. The next program to be sponsored by the council, featuring Carrie Cramm, the vice president of Community Impact for Pikes Peak United Way, will be held Wednesday, April 18, at 2:30 p.m. in the Lewis-Palmer School District administration building. The topic is quality-of-life indicators for the Pikes Peak region. At that time elected officials, business people and other interested parties will learn of the state of the community. To say it was a warm and dry March may be a bit of an understatement. March 2012 will go down as one of the driest and warmest months of March in at least the last hundred years around the region. And after a snowy and cold February, these conditions really supplied quite a contrast. For the month, temperatures were almost 7° F above normal and precipitation totaled only a little over a tenth of an inch, less than 10 percent of normal. On top of this is the fact that March is normally one of our wetter winter months (just behind April) and the moisture normally received during the month is very important for a healthy start to the growing season. So let’s hope April continues the trend we’ve seen since last fall where we seem to have a pattern change every 30 days or so that results in above-normal moisture and below-normal temperatures. Warm and dry conditions affected most of Colorado during March. For example, Denver had its second warmest March since 1873 (1910 still holds the record) and its driest March since 1872 (previously 1908). Colorado Springs didn’t do much better, also coming in with its warmest March on record (previously 1910) and sixth driest March on record. March started off with spring-like snow over the first two days. A cold front moved through during the late morning of the 1st, and clouds thickened during the day. Snow began to fall off and on from mid-afternoon through evening. Most of us picked up 1 to 3 inches of new snow. Conditions were quiet through late the next morning, but the stronger March sunshine combined with cold air aloft to produce convective snowfall, some of which were heavy, during the afternoon and early evening of the 2nd. These produced another quick half inch to inch of new snow. Cold air also continued to filter into the region, and as skies cleared that evening, the fresh snow on the ground caused temperatures to rapidly tumble. Some of the colder areas around the region dropped below zero late that evening and the next morning. But, as is often the case in March, temperatures were able to quickly warm once the sun returned, melting the snow. Highs reached well into the 50s on the 4th and 5th, and when combined with gusty winds, much of the snowpack disappeared around the region. The first full week of March was mild and breezy, as we just missed out on a significant snowfall. Temperatures reached well into the upper 50s to start the week, as mostly sunny skies and breezy conditions helped temperatures warm. This was ahead of a storm that was moving into the desert Southwest. This storm then moved into New Mexico, about a hundred miles too far south to bring us any snow. Temperatures did cool to normal levels, with highs holding in the 40s from the 7th through the 9th. Areas of low clouds and fog affected us at times and helped produce a few flurries. This storm continued to slowly spin to our south over the next few days, as it was cut off from the main flow. As it finally began to depart the region, a few bands of clouds moved through and produced a quick snow shower during the morning of the 11th. Temperatures quickly warmed behind the departing storm, reaching well into the 50s that afternoon. The week of the 12th was warm, windy, and dry across the region. Temperatures were above normal every day, reaching well into the 60s most afternoons. Winds gusted well into the 30 to 40 mph range on the 12th and 13th, helping to dry the landscape. Mild and quieter conditions under plenty of sunshine settled in for the 13th through the 15th. Then southwesterly winds kicked up again on the 16th and temperatures soared to near record levels, reaching the upper 60s, with some of the lower elevations around the region touching the low 70s. Not bad for the last week of winter. It was another warm and dry week around the region with record highs set on several afternoons. We did have a brief break in the pattern on the 19th and the 20th, as temperatures stayed at or slightly below average both days. Areas of low clouds and fog on the morning of the 20th produced a few flurries as well. But this was short-lived as the storm responsible for this brief intrusion of cooler air moved too far south to do us much good. Instead, high pressure quickly built into the region from the west. Temperatures warmed under sunny skies from the 50s to the 60s as we headed into the first days of spring. Then, as the area of high pressure continued to move off to the east, strong southwesterly winds began to kick in. This allowed temperatures to really soar, as the downslope component of the winds helped to aid an already mild air mass. Highs touched the low 70s for some of us on the 23rd, the first time we reached the levels since last October. Temperatures stayed in the upper 60s and low 70s through the weekend, reaching daily record highs at several locations along the Front Range. The remnant snow also quickly melted as the desiccating winds came during the afternoons and quickly dried out the dead vegetation. High fire dangers were the norm and will be until we get our next heavy wet snow (which will happen at some point yet this spring) or we begin to "green up" the vegetation. There was no change in the patterns through the end of the month, as temperatures stayed at or above record levels through the 31st. April is known for a wide range of weather conditions in the region and is on average our snowiest month of the year. We can see 70° temperatures one afternoon and a blizzard the next. Several recent years have seen over 50 inches of snow accumulate during the month. It also melts very quickly, often adding very beneficial moisture to the soil and helping the vegetation that is just getting started. We can hope this year will bring abundant moisture to make up for some of the dry conditions we experienced last month. Monthly Precipitation 0.13" (-1.73", 93% below normal) 100-year return frequency value max 4.29" min 0.22"
Click here for guidelines regarding letters to the editor. Ana Konduris, president of Direction 38!, gives a very misleading picture of student enrollment trends in District 38 in her letter to Our Community News ("District 38 must retain more students," March 3). First, Ms. Konduris focuses on only one detail of the enrollment picture when she points out that fewer students "choice-in" to District 38 schools than "choice-out." But this statistic does not measure all aspects of the choice issue. For example, it does not measure the number of families who choice-in to D-38 by choosing to move to the community. For most families, the quality of the school district is a factor in their choice of where to live. And in fact, between 2004 and 2011, overall enrollment in D-38 schools increased, even though some families elected to send their children out of the district. During that same time period, enrollment in District 12, to which Ms. Konduris compares District 38 unfavorably in her letter, grew by a smaller percentage than did enrollment in D-38, even though D-12 posted a higher choice-in number. So it would seem that choicing-in/choicing-out is not a very complete measurement of the district’s ability to attract students, or of the broader choices families make about where to educate their children. Ms. Konduris describes Directions 38! as a grassroots organization, but in fact, the group has only four members, according to one local media report. Their website says their goal is to provide an "additional source of information" about District 38, but the information they provide typically is chosen to undermine the incumbent school board and show the district in the poorest light possible. Their real goal is to create dissatisfaction with public education in D-38, although on the whole the district is quite successful, with the top remediation rate for a public school district in Colorado. A favorable remediation rate means high school graduates are ready for college, with little need for remedial coursework first. Maybe that’s one reason why overall enrollment in the district is increasing. A few weeks ago, a volunteer who is a senior citizen, a licensed teacher, and currently working toward a PhD in educational leadership was invited to be a guest speaker at Palmer Ridge High School. The teacher requested this volunteer’s expertise to address his classes for a full day on a Thursday and a block class on a Friday morning. The lesson concerned the qualities and characteristics of strong leadership. Unlike other volunteers who sign in and proceed to their destination, this person was told to wait in the office to be escorted up to the classroom. A dean of students was sent into the classroom to monitor the lesson this volunteer was team-teaching. As planned, the lesson went very well and the students were thoroughly engaged. Both the teacher and volunteer also found the classes to be gratifying, as good teachers do when students experience active learning. On the second day, the teacher was extremely upset because he had been chastised severely by school administration for having invited this particular volunteer. Why did PRHS administrators fear this individual volunteer? Later, the teacher was told directly it was because it was me, Stephen Boyd. I have written opinion pieces accurately raising issues regarding the policies and practices of this school district. Are we being punished for exercising our First Amendment rights? I have relatively thick skin gained from a first career in business and was not bothered by the shabby treatment I received; however, the teacher felt demeaned and that his professional integrity had been challenged. Ironically, later, the dean who observed the teaching commented on what an outstanding lesson it was. If highly qualified volunteers aren’t welcome to participate in public education, then students suffer. What is being modeled for our staff and students with this kind of retaliatory, vindictive, and small-minded style of leadership in D-38? I have a child that attends Lewis-Palmer Elementary School, and I have been involved in the activities of the school district as DAAC chairperson since May 2010. I regularly attended school board meetings and work sessions. I have watched and listened as the board has navigated these last four years, having to cut a total of about $10 million. And right now, it looks like they will have to cut more than $1 million next year. I have listened to them discuss and debate countless issues—from bus routes, to food services, to marketing the district. I have watched them put time and effort into making informed decisions, by consulting experts and getting the community’s opinion. I have not always agreed with their decisions, but for the most part, I feel they have done their best. In the coming months, there are going to be discussions about a mill levy override (MLO) on the 2012 ballot. An MLO is an investment in our community. All MLO money stays in our schools. We live in a competitive world, and giving our schools a competitive advantage with an MLO is not just good for the short term, it is smart for the long term. I believe this so much that I, along with a few other concerned parents, have organized a group to help educate the community on what exactly the cuts have been and where the money is most urgently needed. We are calling ourselves Friends of D-38. This is my home. I am invested in this place. I have a stake in it, not just limping along but thriving, now and for years to come. Did you know that our neighborhood is teeming with authors? Just as the Tri-Lakes area has become a mecca for artists, writers, too, are finding it a comfortable place. Some of their work is described below. 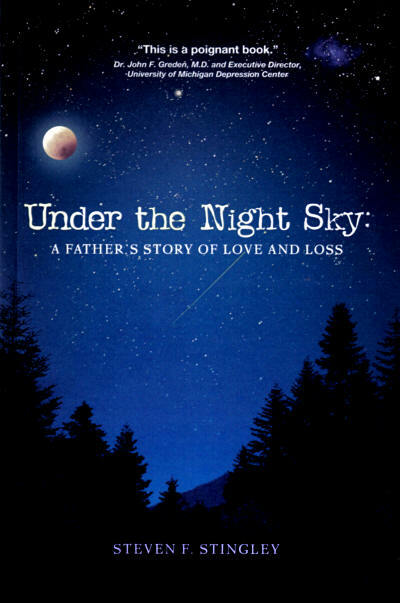 A father struggles to make sense of the tragedy of losing his oldest son at the tender age of 23. As Stingley embarks on a personal journey to find answers to the elementary and existential questions, he returns to the things the two of them enjoyed most: spending time outdoors and sleeping under the stars. Math teacher Bonnie Pinkwater is at it again. When she and her Wiccan sidekick find the body of Bonnie’s boss, their day takes a decided turn for the worse. But when that same body disappears, then reappears seated at his desk, Bonnie decides to nose around and turns up killer motorcyclists, suspicious preachers, tyrannical dwarves, high-stakes poker games, land-grabbing CEOs, and a damaged math genius. Set in East Plains, Colo., this is the fourth book in the Pinkwater series. Four college friends form a backpacking club, and each year they gather to choose the most remote spot, farthest from civilization, for their annual summer solstice trip. One year, everything changes. A mystery, a murder, and a strange conspiracy theory emerge from their innocent annual outing. Out of the hills of the Ozarks comes a threat to our country’s national security and to the friends, who find they really don’t know one another very well. Since prehistoric times, the Garden of the Gods has been a source of fascination. This geologic formation in Colorado Springs was a seasonal camping site and source of spiritual significance for Ute Indians, and scientists have discovered evidence of dinosaurs, prehistoric cultures, and unusual biological associations. 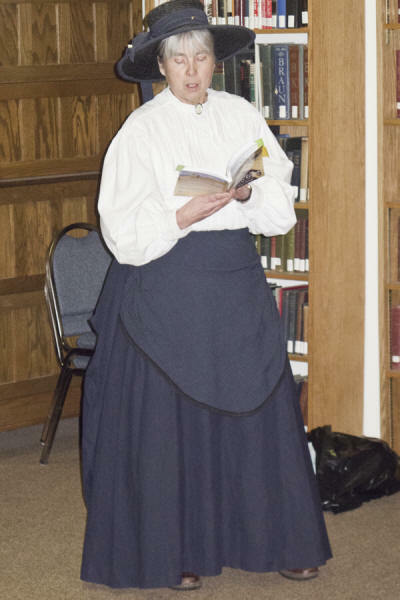 Hamill, a retired teacher and member of the Manitou Springs Heritage Center, wrote her master’s thesis on the history of the park. That research was the inspiration for this book. This book presents five principles for living a successful life as derived from the perspective, reflections, and regrets of dying hospice patients. Learn about their message on the meaning of life and the powerful scientific principles proven to increase success in every aspect of life. These secrets may enable you to start living the life you deserve—a successful life. An Irish lad growing up in a small village takes advantage of unusual opportunities and finds his mundane life exploding into one of intrigue, danger, and international recognition. Cox, a retired professional investigator, uses his vast experience to spin an engrossing tale of the dismantling of an international terrorist organization, with a little romance thrown into the mix. On his 16th birthday, Bobby Greenfield learns of an unusual family talent, which may actually be a curse. From an uneventful day at the Greenfield family bank, the reader is transported into the future and back, giving that same day a sense of urgency and intensity. Focusing on the crossroads we face throughout our lives, Hammitt shows how alternate paths can have unexpected ripple effects on the future. Upon his return from a very bad business trip, Hunter Veritas gets a traffic ticket. This is the first in a series of events that leaves his life in shambles, as he loses his job, his wife, and his friends. But then a young stranger introduces him to a new world that exists within and beyond our own, and she slowly coaxes him back from the brink. Why not try sampling some books by our local authors? You may be pleasantly surprised by the talent in our midst. 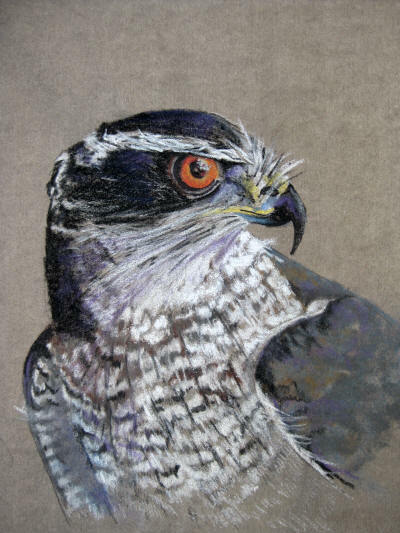 Below: Drawing by Elizabeth Hacker of an adult Northern Goshawk. 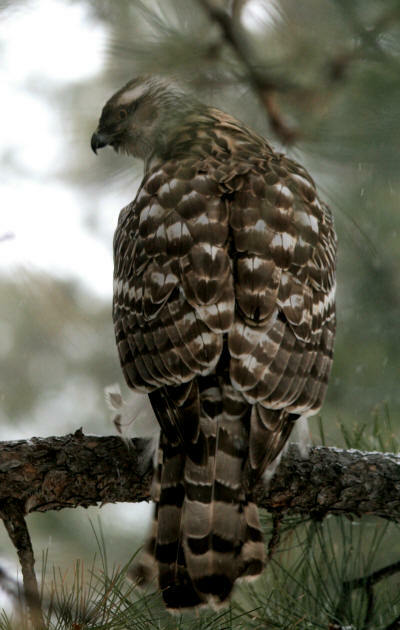 Below: Photo of a juvenile Northern Goshawk by John Heiser. As Chinook winds blow winter away from the Palmer Divide, birds are establishing territories and some are already nesting. A few weeks ago, John Heiser emailed a photo of an accipiter he and his sweetie Francy spotted in their yard. He thought it might be a red-tailed hawk, but this bird had a long banded tail, yellow eyes, an eye ridge, and a light eyebrow, all the marks of a juvenile accipiter. Birds of prey have six major classifications including eagle, vulture, buteo, accipiter, falcon, and harrier. The red-tail hawk is a buteo. In Europe it is referred to as a buzzard because it eats carrion. Many birds of prey consume carrion, but the accipiters and falcons eat only fresh prey and are smaller than the buteos. Accipiters are fast and agile fliers but not as aerodynamic as a falcon. Accipiters are forest-dwelling birds of prey distinguished by their long tails and lack of a procoracoid foramen, which allows them to bend their wings and bring them in close to their bodies. Their long slender bodies, short broad wings, and long tails allow them to effortlessly fly in the forests. There are three species of North American accipiter: the northern goshawk, the Cooper’s hawk, and the sharp-shinned hawks. Juvenile accipiters have similar coloring but vary in size. Due to its large size and eyebrows, I thought John’s bird might be a northern goshawk but to be sure I forwarded the photo to naturalist Ken Pals and he confirmed it. The goshawk is the largest of the anccipiters and is a powerful and aggressive hunter. Adult goshawks exhibit regional color variation, but the ones I’ve observed on the Divide have slate gray feathers on their backs with light gray striped under parts. The top of their heads are black with distinctive white eyebrows set above an eye ridge. Their eyes are bright red. One summer I observed a pair of adult northern goshawks east of Highway 83 perched on poles. I could see their red eyes and even though I was sitting in my car, those red eyes followed me as if daring me to get out. Juvenile goshawks look like a different species. Their brown back is more similar to a red-tailed hawk. But their tails are long with brown bars and they have a light yellow eye, which is not at all like the red-tailed hawk. In the photo, I could see the eye ridge and the beginning of an eyebrow. Goshawks reach sexual maturity at the end of their second year. Due to its size, I assume John’s goshawk was a second-year female. The flight is typically a "flap, flap, glide" pattern. The short, robust wings enable rapid acceleration up to 38 mph and its long tail provides excellent maneuverability, allowing it to fly between trees. The northern goshawk hunts birds and mammals including crows, squirrels, mice, and rabbits but is capable of killing much larger prey such as geese. Its name comes from the Old English word "gos," meaning goose, and it was so named because it often preyed on geese. It typically hunts from a concealed perch, moving often to avoid detection. It also flies along the forest edge or low over open fields looking for unsuspecting prey. Once prey is spotted, it aggressively pursues it. The goshawk may swoop down on it, crash into brush to grab it, or patiently wait for it to emerge from its hiding place and pounce on it. The goshawk uses its strong legs and feet to grab its prey and then kills it by kneading its talons into it. It has a small curved beak that it uses to remove the fur and feathers from its prey and strip small pieces of flesh to swallow or feed to its young. The northern goshawk is a secretive, nonsocial bird except during mating season. In March, goshawks return to their nesting territories. The male performs an undulating flight and calls out in his gull-like voice to welcome a mate or attract a new one. Pairs form long-term bonds that last until death but may separate after the juveniles leave. They reunite the following spring and return to the same nesting territory. If a mate dies, the remaining bird is thought to search for a new partner. In April, the female will lay two to five large tan eggs in a nest made of sticks located near the top of a tall tree. The female broods the eggs for about a month while the male aggressively guards the nest and brings her food. Chicks are hatched covered in down and completely dependent on their parents. Pin feathers begin to emerge in 10 days and the chicks will grow to the size of the adult within two months. After fledgling the nest, juvenile goshawks remain in the adults’ territory for about a year to hone their hunting skills. Parents no longer feed them, but they do share food to supplement their diet. After a year, the juveniles leave their parents’ territory and establish one of their own. The northern goshawk was, and still is, used in falconry. Attila the Hun wore an image of a goshawk on his helmet to scare his enemies. Goshawks move about within a large region, but they are not considered migratory birds. I am one of the few who still write letters and enjoy using beautiful stamps. When the "Birds of Prey" collection was released in January, I was first in line. It is a set of five beautifully illustrated stamps that includes the northern goshawk. Email me a note with your name and address and I’ll snail-mail you a reply with one of these stamps. The art and wine night is a recent art world phenomenon that is catching on all around, and people are raving about it. The art walks and the wine tastings have met their new accomplice in that people are having a glass of wine with artist-teachers at hand and actually making a painting themselves to take home. So it is more than an art class, in a sense, and more than a gallery show or wine-tasting as well. It is nice to have some libation and enjoy looking at paintings and sculptures, to be sure. The art openings and art walks and art hops we have here in our Tri-Lakes area enrich our lives, and we know we can look forward to them. So it is a natural addition to make some art on an evening out. Uncorked art night doesn’t just mean wine and art. The idea is that we uncork our inner artist in enjoying the colors and materials with the guidance of a professional artist. From ladies night out to date night to fundraisers, retirement parties, and company team building, these forays into the art side of us are catching on and bubbling forth in a lot of ways. Some venues offer wine, tea, or sodas and a light menu to choose from. Or, participants may bring their own beverage and food, and everything else is provided for the art experience, from paint and canvas to cups and napkins and beyond. It’s kind of a party with something to take home as a memento. No experience is necessary for the participants. Most of the places around the country offer the "one size fits all" style of group painting of a single image, yet no two paintings end up alike. Each has the indelible brushstrokes and intent of the person working on the piece, and they send you home with a finished work of art to fill your heart and your home with some good memories. Do we have these in our town? A number of places with the space are starting to offer these creative times in the evenings and afternoons. No longer just an art show to visit and leave, now the patrons can drop by, see what is available, check their calendars, and start their art during general studio times as well as with planned events. Some places also have live music for ambience, so it reminds me of the grand times of enjoying the belle époque of last century, only this version is for an afternoon or evening while we visitors are treated like royalty. Almost every version of this new craze that I’ve found has a common plan of a sign-up calendar per the themed paintings, with eight to 12 people attending. Local venues offering these art-making nights include Secret Window Studio and TCLA/Uncorked Art Nite. Hopefully we’ll all enjoy more of this type of fun throughout our summer art season. Our long twilight evenings offer perfect light for painting outdoors, too. 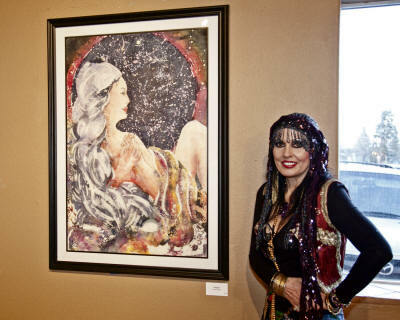 Tri-Lakes Center for the Arts (304 Highway 105, Palmer Lake) held the March 30 artist reception for the "Predictions and Perceptions from the Spiritual Realm" show to the music of Mango fan Django as crowds filled both galleries to overflowing. Bright colors, many large works and a wide variety of paintings, photography as art, and a special photography exhibit of traditional Tibetan mandalas of prayers in sand by Lau Maddox rounded out the wide range of interpretations. The show runs through April. Monument Arts (meetings held at Secret Window Gallery, 47 Third St., Monument) begins a monthly Friday Night Art Walk on April 13 and will continue the fun monthly event into the fall. It is a recently created local arts group that includes the town of Monument as well as the surrounding environs, for some upcoming arts events. With an eye to getting the same lively Friday night culture going for locals as well as enticing weekend visitors traveling between Denver and Taos, Monument Arts ongoing events span an area including Monument, Palmer Lake, Woodmoor, Jackson Creek, Larkspur, the Air Force Academy, and Colorado Springs, adding a plethora of high-level art studios and local galleries. The Historic Monument Merchants Association’s "Monument Art Hop" will on be held the third Thursday of each month beginning in May. Monument Arts Second Friday Art Walks: Artists who would like to share their art with the community may contact Monument Arts at info@monumentart.net, or talk to Anthony at Secret Window Fine Art Gallery, phone 719-481-9600, or Maggie at Bella Art & Frame, 183 Washington St., Monument, CO 80132 (719) 487-7691 for more information and requirements. 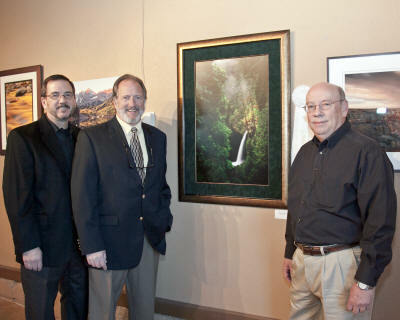 Below: During March, the Tri-Lakes Center of the Arts (TLCA) hosted the third annual Visions of Light photography exhibition. The talents and artistry of 39 photographers were on display in 90 photographs. The exhibit judges are, from left, Mark Kirkland of Kirkland Photography & Design Inc. and Terry Moore of The Family Studio. They selected Doug Bennett’s Eden’s First Light as Best of Show. Bennett’s subject for this photograph was Metlako Falls, located in Oregon’s Columbia River Gorge National Scenic Area. He captured the moment when midday light streamed through fog. Photo by David Futey. 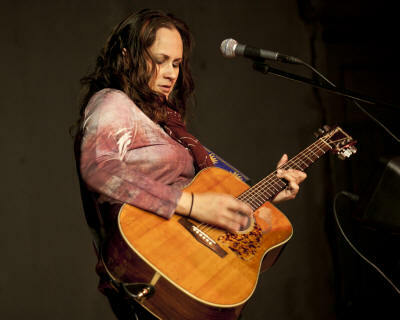 Below: On March 10, Wendy Woo returned to the Tri-Lakes Center for the Arts stage with her usual dynamic combination of room-filling vocals and driving guitar sound. She is working on a 10th CD that will be available next year. She continues to receive accolades in her 20th year of performing. Her band, The Wendy Woo Band, was recognized as the Best Local Band at Denver’s Channel 7’s 2011 A-List competition. Information on Woo is at www.WendyWoo.com. Information on upcoming events at the TLCA is at www.trilakesarts.org. Photo by David Futey. David Futey can be reached at dfutey@ocn.me. Photos by David Futey. David Futey can be reached at dfutey@ocn.me. Below: On March 10, the Western Museum of Mining & Industry (WMMI) celebrated Women’s History Month with "Women in Mining." The day was filled with historic portrayals, hands-on activities, and mining-related displays from the Women in Mining organization. Author Nancy Oswald (left) brought to life delightful characters from her children’s novel Rescue at Poverty Gulch. Information about upcoming events at the WMMI is at www.wmmi.org. Below: John Stansfield portrayed Dr. Charles F. Gardiner, who cared for miners in early Colorado mining camps and was an advocate of the innovative, "fresh air" cure for tuberculosis. Below: Trisha Dudding told the famous riches-to-rags story of Colorado’s Baby Doe Tabor. Back: The Tri-Lakes Women’s Club (TLWC) thanked Palmer Ridge High School (PRHS) student, Matt Zarkovacki (center) for donating his time and shop skills in support of the club’s Sponsor Program. The woodwork for the plaques was done in David Bedia’s shop class on equipment donated by the TLWC under their grant program. Pictured on each end are the Tri-Lakes Women’s Club Co-Presidents, Sally Stephenson (left) and Debbie Kessler along with Bedia (left) and PRHS Principal Gary Gabel. Matt and Gary are holding one of the boards produced by Matt. Photo provided by the TLWC. Below: Sherri Oram-Smith, left, vice president of the Operation Round Up Board of Directors, presents a $4,000 grant to Tri-Lakes Health Advocacy Partnership (HAP) board Vice President Dave Betzler. HAP was recognized for its program of providing weekly nutritious lunches for senior citizens in the Tri-Lakes community. About 2,000 low-cost lunches per year are served. Operation Round Up assists non-profit organizations, communities with special needs, and individuals who have suffered from personal disasters. 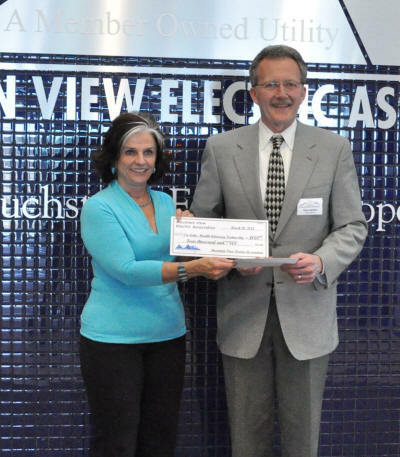 Members of Mountain View Electric Association (MVEA) make contributions as they "round up" their bill each month. Operation Round Up strongly encourages community-oriented programs and called HAP’s lunch program "a model of citizen involvement to help its local community." Photo provided by the Tri-Lakes HAP. 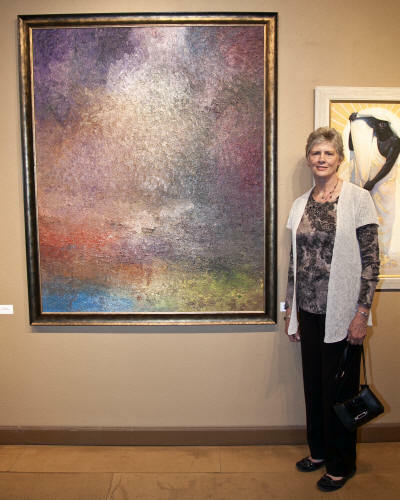 Below: Carol Naylor is shown next to her work Stargazer, a piece created with watercolor and wax on rice paper. Naylor’s motivation for the piece came from thoughts about her friend, who is an owner of the Stargazer Theatre in Colorado Springs. Below left: Margaret Hyer displays her late husband Bill’s work, Genesis Day Four. About 40 of Hyer’s colorful oil paintings remain and eight are on display at the TLCA during April. Below right: One of Richard Hart’s contributions was The Unfathomable Voyage. On March 30, the Tri-Lakes Center for the Arts (TLCA) hosted two art show openings. 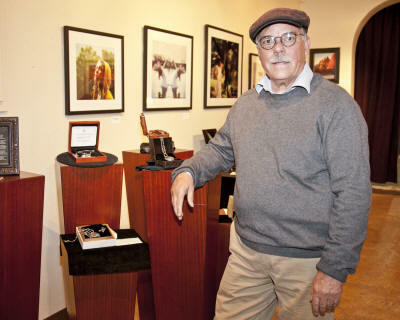 In the Lucy Owens Gallery, Dr. Douglas Layton displayed his Auriolus Jewelry Creations. Layton has traveled to over 100 countries, seeking antiques and antiquities to restore and revive into wearable jewelry. Layton said he "gives the piece new life" as "jewelry is timeless and needs to be re-introduced into the modern world." 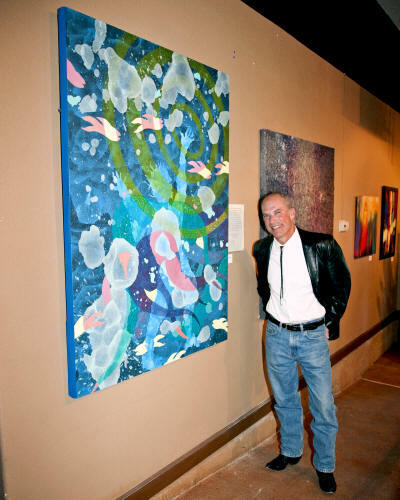 Layton’s works were on display until March 31. In the Main gallery, the Predictions & Perceptions from the Spiritual Realm show was on display. The show runs through April and consists of paintings, mixed-media works, photography, and neon art from 22 artists including Thomas Blackshear, the late Bill Hyer, debi Story Maddox, Margarete Seagraves, Carol Naylor, and Richard Hart. Information on Layton is at www.AuriolusJewelry.com. Information on upcoming events at the TLCA is at www.trilakesarts.org. Below: Past, current, and future Tri-Lakes Women’s Club Presidents gathered for lunch at the Wisdom Tea House in Monument. Pictured are: (front row) J.J. Kaelin and Yvonne Jennings (second row) Maxine Pitt, Peggy Lilly, Sally Stephenson, Debbie Kessler, Pam Sekavec, and Lisa Simms (back row) Sharron Steffey, Rae Jean Claybaugh, Jackie Timura, Gail Wittman, Mary Mills, and Gerrie Maixner. Missing from the picture: Debby Bielanski, Jan Cashman, Junette Pearson, Terry Franz, Sharolyn Hoskinson, Donna Wagner and Donna Adams. Photo provided by the TLWC. March brought spring break and several outstanding programs, including Katherine Dines and Hunk Ta Bunk Ta Music, Neil McIntyre’s Hip-hop for Kids, and Science Matters. All were well attended by enthusiastic audiences. Patrons ages 12 to 18 are encouraged to apply as summer reading volunteers to register kids for the program and award their prizes. Shifts are two hours long, seven days a week from morning through evening. Or, you can be a substitute for a short period while others are on vacation. Mandatory training will be offered in mid-May. Pick up an application at the circulation desk and join us for a summer of fun. Homeschool students are invited to bring a favorite book that they’ve read and a prepared book report to share with the group on Tuesday, April 3 at 11:30 a.m. Props and costumes are allowed, too. We’ll begin with preschoolers and progress upward. Teens ages 12 and up are invited to come and make Meg and Greg Eggs to take home. Come be creative and share snacks at 4 p.m. on Friday, April 6. To register, call the library at 488-2370. National Library Week is observed in mid-April. Please join us for a reception with the library’s Leadership Team from 3 until 5 p.m. on Tuesday, April 10. They are interested in your thoughts, ideas, and feedback about the library and its activities. The teen book club Book-Eaters will meet on Wednesday, April 11, from 4 to 5:30 p.m. This month is a Book Potluck. Bring two or more books you want to talk about. Discuss characters, plots, and writers and help create a display for Teen Literature Day. Snacks provided and no registration required. 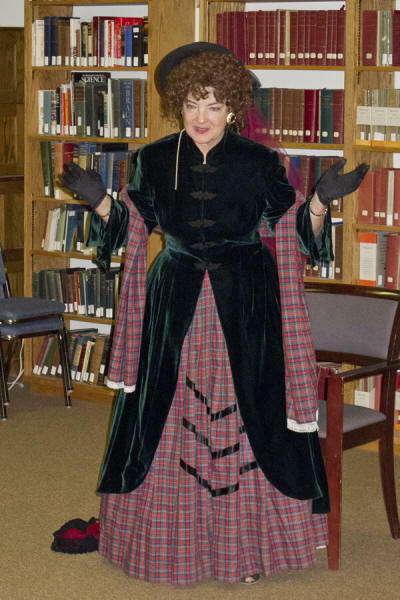 April’s Family Fun event on Saturday, April 14 at 1:30 p.m. is "It’s a Big, Wide, Dreamy World" with Patti Smithsonian. You can’t help but laugh as Patti’s crazy puppets tell this delightful story. Back by popular demand: Learn how to make freshly baked bread at home. Baking bread from scratch is easier than people think and healthier than the store-bought variety. Learn to make two simple yeast breads: honey oatmeal and white dinner rolls or pizza crust. Beginners are welcome and there will be finished breads to taste. Join us on Sunday, April 15, at 2 p.m. The Monumental Readers Book Club will meet on Friday, April 20, at 10 a.m. to discuss Cutting for Stone by Abraham Verghese. All patrons are welcome to join. Fabulous Friday Fun will explore the Dewey Decimal System through activities and games on Friday, April 20, at 4:15 p.m. There will be snacks and rewards for finding answers. Every participant earns a free book. Suggested for upper-elementary and middle school students. There’s fun for all at the monthly Lego club on Saturday, April 21, from 10:30 to noon. We’ll provide the Legos and you bring the creativity. Please do not bring your own Legos. Bring your camera to record your creation—all pieces used remain the property of the Pikes Peak Library District. On the afternoon of Saturday, April 21, from 1 to 5 p.m. the library will be offering the AARP Mature Safe Driving Program. The program is a refresher course designed for motorists ages 50 and older. Graduates may present their course completion certificate for their insurance agent for a discount. The charge for the four-hour course is $12 for AARP members and $14 for non-members. Class size is limited and registration is required. "Victory, Victory, Victory!" So begins an actual letter dated April 29, 1862, from Charley H. Morrison, a Marine stationed on board the U.S.S. Brooklyn during the Civil War. Share Charley’s experiences during the Battle of New Orleans through several of his carefully preserved letters read by students from the Palmer High School honors history class. Katherine Sturdevant, professor of history at Pikes Peak Community College, will discuss why saving original documents and studying the ordinary man’s Civil War are so important. Join us on Sunday, April 29, at 2 p.m. for this fascinating program, "Letters from the Civil War." On the walls during April is Springs Beat: the Photojournalism of Stan Payne 1947-1960. In the display case is a demitasse collection from Europe. Come to the library and read with one of our Paws to Read dogs. Reading to a patient dog can improve fluency and confidence in young readers. Read with Misty, the tiny Sheltie, on Thursday, April 12, from 4:30 to 5:30 p.m. Read with our golden retriever friend Kirby on Saturday, April 28, from 11 to noon. April’s Family Fun program is Lions, (no Tigers), and Bears—OH MY! Living safely with Colorado Wildlife. Wildlife officer Steve Cooley will give a brief introduction to Colorado wildlife and their habitats. He will tell us how to bear-proof our homes and teach us what to do if we encounter bears or lions. Officer Cooley will bring lots of interesting wildlife objects for a fun hands-on experience. Join us on Saturday, April 21, at 10:30 a.m. The Palmer Lake Library Knitting Group welcomes knitters of all skill levels on Thursdays from 10 until noon. Bring your project and enjoy the company of other knitters. The Palmer Lake Book Group will meet at 9 a.m. on Friday, May 4 to discuss The Postmistress by Sarah Blake. New members are welcome and no registration is required. On the walls in the library, view works from Expressions of Beauty-Shared, photography by Laurisa Rabins. Please note that all Pikes Peak Library facilities will be closed on April 8 to observe Easter. 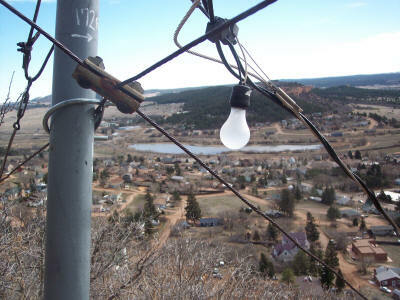 Below: View of the Town of Palmer Lake from the Palmer Lake Star. Photo by historian and retired Air Force Col. Jack Anthony. 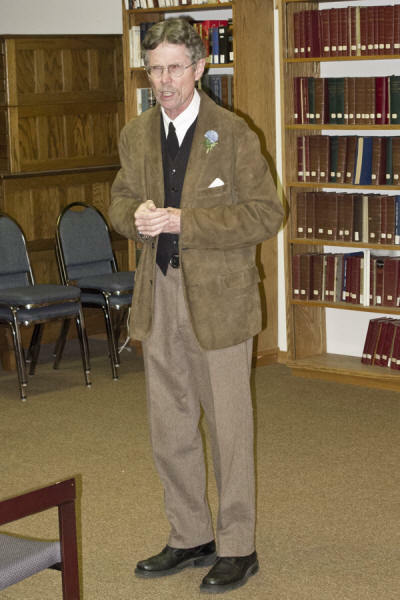 Jack Anthony, a retired Air Force colonel, historian, and Palmer Lake Historical Society Board member, announced March 15 that the process was underway to nominate the Palmer Lake Star for listing in the State Register of Historical Properties and the National Register of Historical Places. The intention is to have the nomination ready by June so that it might be presented to the State Review Board that meets in September. Anthony told attendees at the meeting of the Palmer Lake Historical Society that the idea for the star originated with B.E. Jack, regional manager of Mountain Utilities one summer day in 1935. On a drive to Palmer Lake from his office in Colorado Springs to check on the progress of his line crew and as the early morning sun lit up the mountain on the horizon ahead of him, he again pictured an idea that he had many times before. This time he vowed to share this idea with someone else before the day was done. It was on this cool morning in early June that the Palmer Lake Star had its real beginning. On his coffee break, he met with Bert Sloan in Sloan’s Café. They discussed the idea. Jack then took Sloan for a ride so that they could view the mountain and envision the idea from a distance while looking at the site. The idea that this would be a memorable sight each holiday season took hold, and the idea began to be put into place. Volunteers put the structure in place by the fall of that year. When the star was first lit, there was a fuzzy aura around it due to the high wattage of the bulbs used. The wattage then was reduced. The star, made up of 91 bulbs, was lit formally for the first time on Dec. 1, 1936, and remained on until Jan. 1, 1937. The Star of Palmer Lake is also called the "Star of Bethlehem." It is lit each Memorial Day as well as each Christmas holiday season. In 2002, a nearly total renovation was required. Project engineer Todd Bell organized and directed the project. The 50 volunteers included volunteer firefighters, Palmer Lake Historical Society members, town officials, and other Tri-Lakes area residents. During the work, the lights were repositioned to make them more symmetrical and a bulb was added. The star is well known in the region and has become, to some, a historical landmark. Bill Reich, who was scheduled to present "Colorado Railroad Ice Houses" at the meeting, was ill and could not attend. In his place the DVD film There Was a Time was presented. It depicted Denver in the 1940s as residents supported the war effort with War Bond sales, dealt with rationing, and performed the required blackout drills. Many were employed in the defense industry at the Remington Arms factory and the Continental Airlines modification center where bombers were completed. The film emphasized that the veterans returning from World War II came home with ideas and the energy that began to build Denver into what it is today. It showed the evolution of Denver into a major industrial city. The next meeting will be at 7 p.m. April 18 at the Palmer Lake Town Hall. Membership is not required to attend. The April presentation will be "Trails to Interstate: Transportation Systems Across the Palmer Divide." Lee Whitely will trace the history of the routes across the divide to their evolution into I-25. Buckle up, rural Colorado, no matter how far you travel. According to Colonel James Wolfinbarger, Chief of the Colorado State Patrol, last year 187 people were killed in crashes on rural roadways, representing 60 percent of the state’s total fatalities. More than half of those killed in rural areas (58 percent) were not wearing a seat belt, compared to 34 percent in urban areas. One of the biggest reasons people give for not buckling up is that they aren’t traveling very far. The reality is that 85 percent of crashes occur within five miles of a person’s home. Others say they simply forget to buckle up because they never developed the habit. Drivers of pickup trucks have the lowest overall seat belt use at just 70 percent, compared to 82 percent in cars. Last year 67 percent of people killed in pickup trucks in Colorado did not wear a seat belt. Pickup trucks are twice as likely to roll over in a crash, despite the belief that they are safer vehicles. So, no matter how far you are going or what type of vehicle you are riding in, buckle up and make sure everyone else in your vehicle does the same. Front Range Animal Hospital in Monument, in coordination with The Colorado Veterinary Medical Association and 9News, are participating in the 9PetCheck. They will provide 72 free wellness exams and rabies vaccines for pets of economically disadvantaged pet owners. To make an appointment, pet owners living on a low income or those who have recently lost their jobs must call the live phone bank, 1-855-699-6397, April 9, 4-6:30 p.m. Appointments will be filled on a first come, first served basis. El Paso County will hold its initial public meeting for the Baptist Road West Corridor Study April 10, 5-7 p.m., at Lewis-Palmer High School, 1300 Higby Rd., Monument. The study will review requirements for safety, capacity, and mobility improvements on Baptist Road West between I-25 and Forest Lakes Drive. The study will further investigate the feasibility of a grade-separated railroad crossing to improve traffic safety and alleviate the congestion and delays resulting from the existing at-grade Union Pacific railroad crossing. The open house will feature informational displays and initial findings. The public is encouraged to provide input. The transportation planning and engineering firm Felsburg, Holt, and Ullevig will conduct the corridor study on behalf of El Paso County. The study is scheduled to be completed by fall. Preliminary and final designs are expected in 2013. Construction schedules will depend on available funding. More information about the study is available on the project website www.baptistroad.com. The Tri-Lakes Economic Development Corp. is accepting proposals for developing its new logo and website. Please email board@trilakesedc.com to obtain a copy of submission requirements and scope of work details. All submissions must be received by April 15. Free income tax filing assistance and e-filing is offered by the American Association of Retired Persons (AARP) Tax-Aide program. Trained AARP volunteers will be available every Monday and Thursday, through April 16, 1-7 p.m., at Tri-Lakes Cares, 235 Jefferson St., Monument, to answer questions and to assist filers in completing their federal and state income tax returns. Volunteers will assist taxpayers in preparing their Forms 1040, 1040A or 1040EZ. Filers are asked to bring proof of Social Security numbers for themselves and for any dependents they are claiming. Filers should also bring their W-2s, 1099-INT, 1099-DIV, etc., to complete their 2011 return, plus a copy of last year’s (2010) tax return. For additional locations, visit www.aarp.org/VMISLocator/searchTaxAideLocations.do. For more information, or to make an appointment (recommended), call Jim Taylor, 488-1317. The El Paso County Board of Commissioners is seeking a community-minded citizen volunteer to serve as an electrical engineer representative on the City/County Electrical Committee. Applications are due by April 20. The City/County Electrical Committee reviews registration of applicants, work performance, and minor variance requests under the electrical code. Further information and volunteer applications are available at the website, www.elpasoco.com. Click on the "Volunteer Boards" link at the top of the page. For more information, call 520-6436. Slash-Mulch Season is rolling around! The annual Forestry Stewardship Meeting (fun, information, and door prizes!) will be April 28, 9 a.m.-noon, at the Black Forest Community Hall, 12530 Black Forest Rd. The site opens for slash hauling May 5, 7 a.m. Mulch will be available after May 19. The Forest Management Demo Day is June 9 at the Black Forest Fire Department training room. The Black Forest Slash-Mulch Program is co-sponsored by El Paso County Environmental Division and the Colorado State Forest Service in cooperation with the Colorado Forestry Association and Black Forest Fire Department. The Slash and Mulch Committee is the citizen volunteer organization that runs the operations. More than 400 people volunteer for this program to keep it running May through mid-September. For more information call Carolyn Brown, 495-3127; Jeff DeWitt, 495-8024; or the county Environmental Division, 520-7878. The Low-income Energy Assistance Program (LEAP) encourages Coloradans in need of financial assistance with home heating bills to take advantage of the program and apply for LEAP benefits before the April 30 deadline. LEAP benefits provide assistance to help low-income families with their heating bills but are not intended to pay the entire bill. The eligibility period for LEAP runs Nov. 1 to April 30. For more information about LEAP benefits, call 1-866 HEAT-HELP (1-866-432-8435), or visit www.colorado.gov/cdhs/leap. The race will be held Sat., May 5, in the Palmer Lake Recreation Area. Juniors (gear and bike restrictions apply) are free. All SM and SW divisions, $32. Citizens/Fun Division (all non USAC-licensed riders), $22. Pre-register online until May 2 at http://mad.sc/cvtltt (USAC-licensed riders) or http://mad.sc/may52012 (non-licensed Citizen/Fun ride). No racers/riders under 10 years of age. Start times posted at http://mad.sc/cvtltt by noon, May 4. Info: www.coloradocycling.org (click on Events, then All Events) or email cpracingteam@hotmail.com. The Forest View Acres Water District is conducting a mail ballot election May 8. If you are designated as an "active" elector in the El Paso County records, you will receive a ballot by mail. Ballots will be mailed April 16-20. "Inactive" electors will not receive a ballot automatically, but can request a ballot from the Designated Election Official (DEO), Sue Blair, (303) 381-4960, (303) 381-4961, or email sblair@crsofcolorado.com. A ballot drop-off location is being provided on election day only (May 8) at the Town of Monument, 645 Beacon Lite Road, Monument, 8 a.m. to 5 p.m. In order for your ballot to be counted, you must sign the affidavit provided on the return envelope, and it must be received at the offices of the DEO no later than 7 p.m. on election day (May 8). You are required to place postage on the ballot return envelope. Spotlight Community Theatre Fifth Annual Summer Musical Theatre workshop and production will be E.B. White’s children’s classic Stuart Little. Auditions and casting are scheduled for May 30-31. The workshop, rehearsals, and performances will be in June. Minimum age is 10. Every workshop participant will be cast in the production! Register now as spaces are limited. For more information, call 488-0775 or visit www.SpotlightCommunityTheatre.com. Calling all young drivers, ages 7 through 17, for the greatest amateur racing event in the world. This year’s Pikes Pike Soap Box Derby race is June 10. The mission of the derby is to educate its young contestants, and inspire fair and honest competition. Mentors are available to help with vehicle design and construction. This year’s derby is proudly sponsored by several local and national businesses and also by Kiwanis and Sertoma clubs. Registration deadline for the regional Pikes Peak Soap Box Derby race is May 12. For more information, visit the derby’s website, ppsbd.com, or contact Glenn Scott, director, at 488-8808 or derbyguy@comcast.net.